Warrington Airfield (and a large number of other little airports), as depicted on the 1947 NY Sectional Chart. 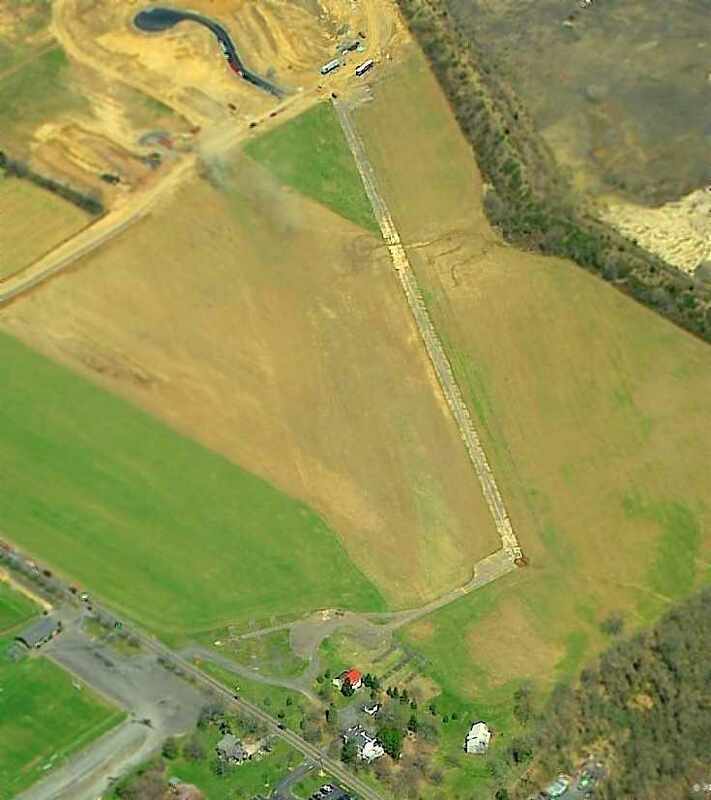 This is yet another one of the large number of vanished little airports which used to surround Philadelphia. as it was not depicted on the 1943 USGS topo map nor on the 1945 NY Sectional Chart (courtesy of Norman Freed). 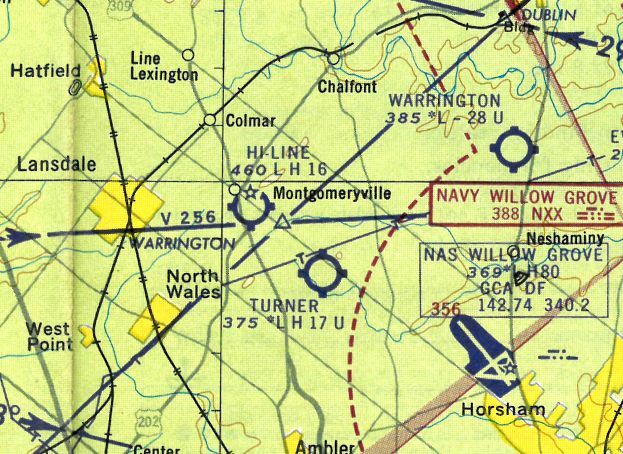 The earliest depiction of Warrington Airfield which has been located is the 1947 NY Sectional Chart. “The Warrington Airfield once operated on farmland owned by the Cadwallader family. The Cornell family would later buy this property. and took on the name of "Warrington Flying Club". 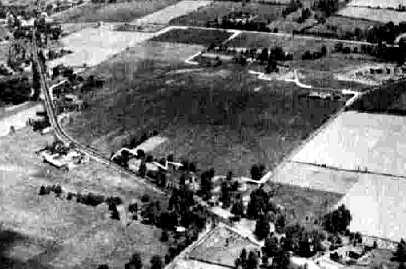 The earliest photo which has been located of Warrington Airport was a 6/17/48 aerial view. with several buildings & 7 light aircraft visible at the south end of the field. An undated (circa 1940s?) 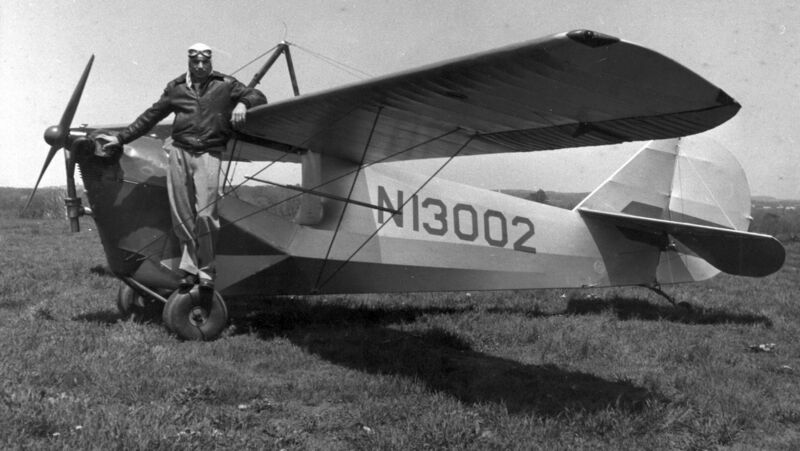 photo of an unidentified pilot on top of N13002, A 1932 Aeronca C-3, serial #A217, at Warrington Airport. 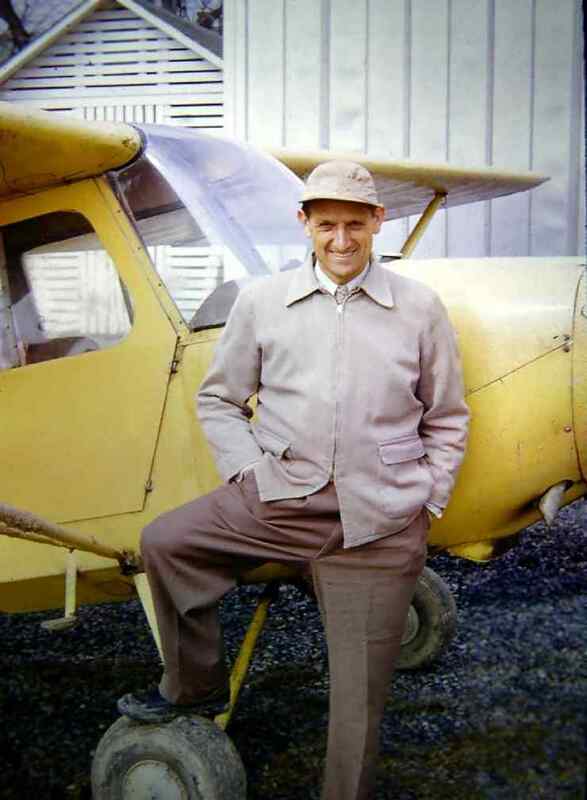 According to Ken Samen, “Alby Cornell took over management of the Airfield in 1951. 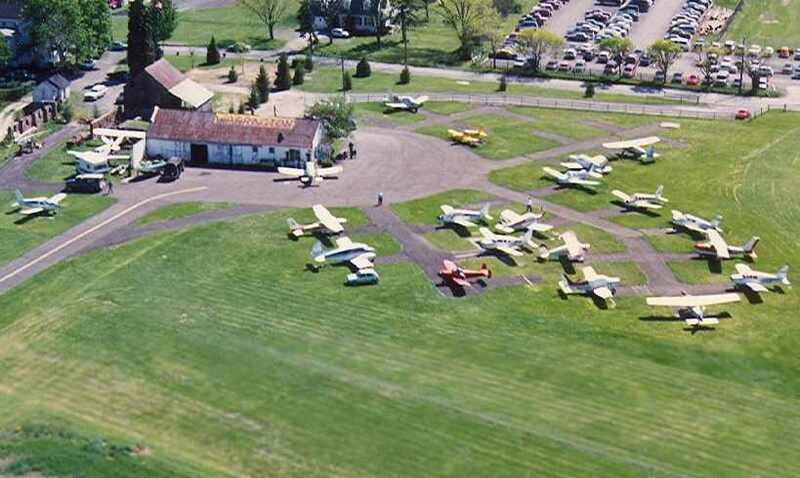 Alby’s services at the airfield include flight lessons, transportation, and plane storage. 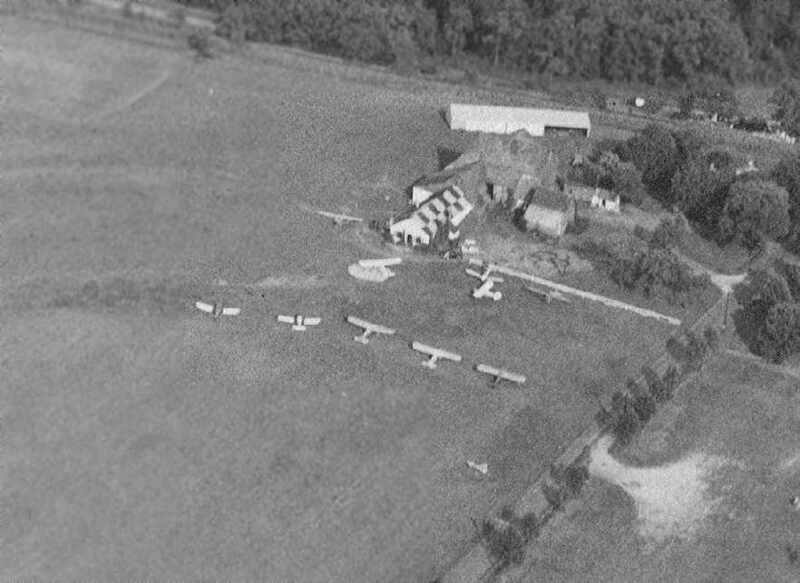 The Warrington Flying Club moved to Montgomeryville Airport on 10/11/53 by a majority vote of the membership. 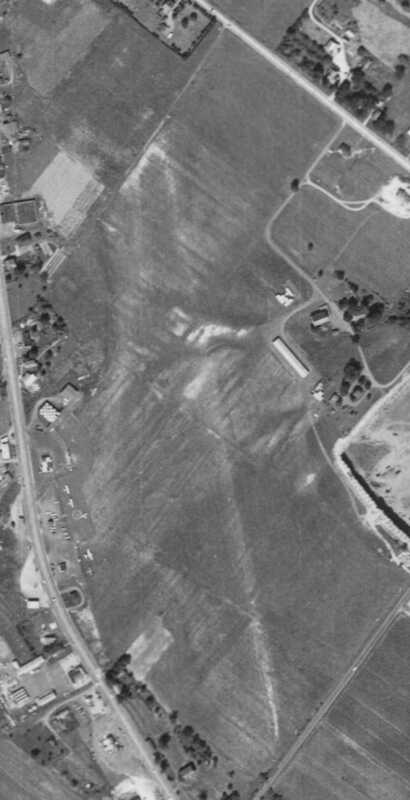 The 1953 USGS topo map depicted a “Warrington Airfield” label on an empty field, with no other details. An undated (circa 1950s?) 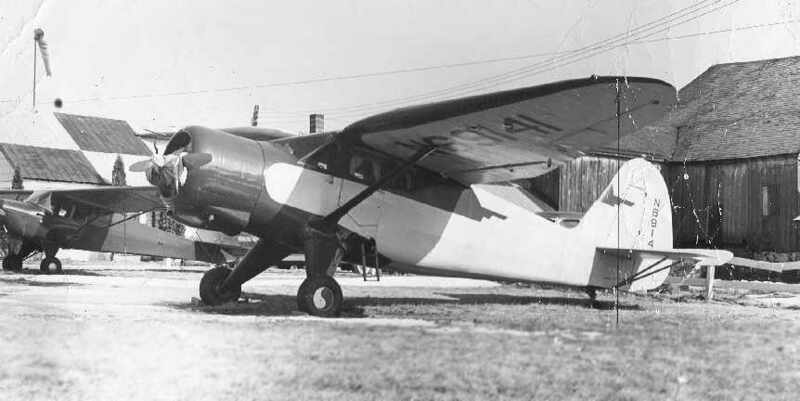 photo of an unidentified pilot on top of N74321, at 1947 Bellanca 14-13-2 Cruisair Senior, serial #1434, at Warrington Airport. 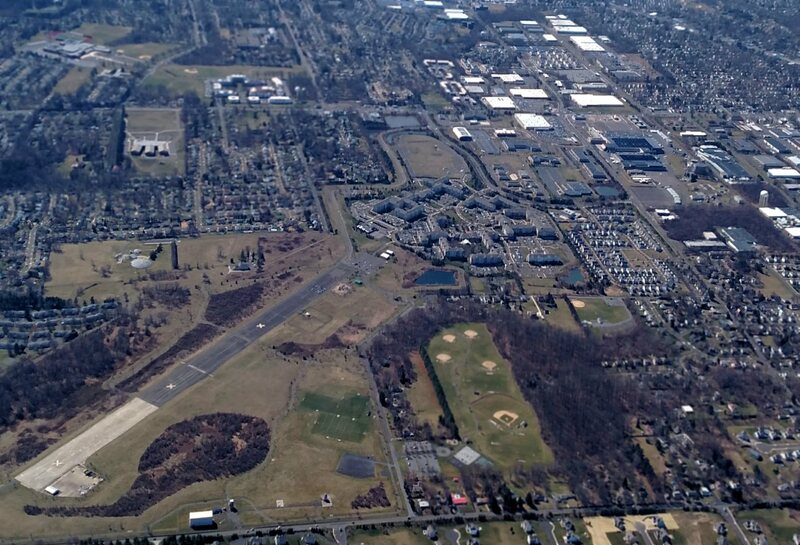 described Warrington as having 2 turf runways: a 2,600' northeast/southwest strip & a 1,425' east/west strip. The operator was listed as Norman Cornell. with several buildings & 9 light aircraft visible at the south end of the field. with the primary runway being a 2,500' turf strip. Warrington, as depicted on the 1959 Philadelphia Local Aeronautical Chart (courtesy of Chris Kennedy). along with 2 buildings at the south end of the field. showed ten single-engine aircraft clustered around a few small hangars. 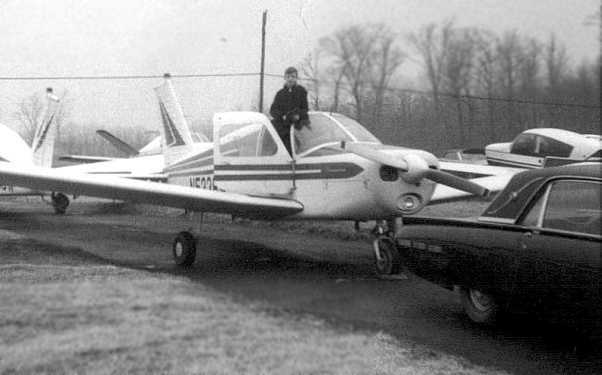 A circa 1960 photo of a Stinson V-77 Warrington Airport, with a Taylorcraft behind it (courtesy of Ken Samen). and listed the operator as N. A. Cornell. 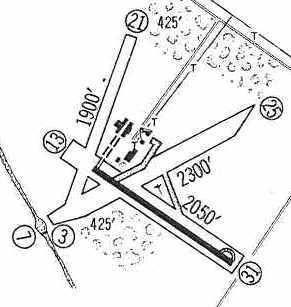 The 1968 USGS topo map depicted a “Warrington Airfield” label on an empty field, with no other details. 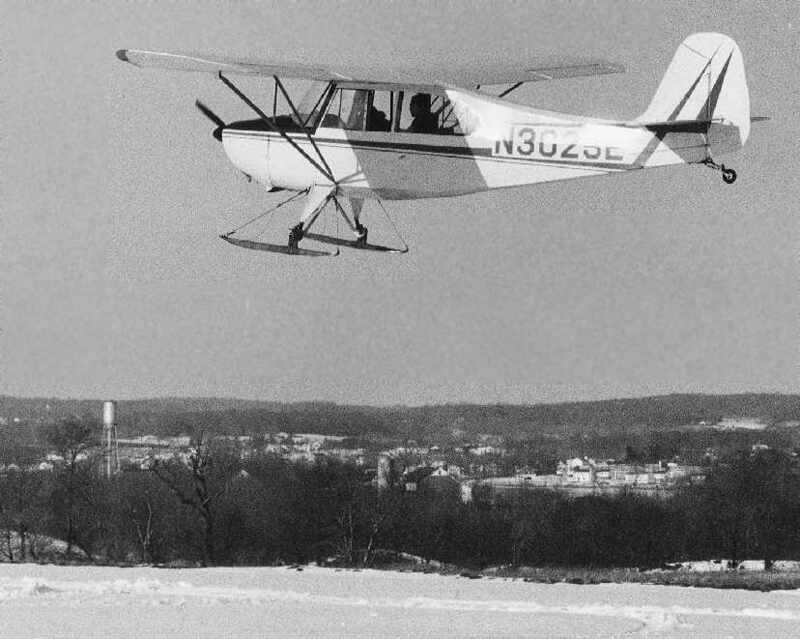 A March 1969 photo of a ski-equipped Aeronca Champion 7AC at Warrington Airport (courtesy of Ken Samen). with a large number of aircraft visible at the south end of the field. The northeast/southwest unpaved runway was replaced by a considerably shorter paved runway, oriented northwest/southeast. The airport's property had shrunken somewhat, as a quarry had eaten up a northern chunk of the property. 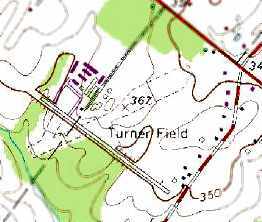 The 1973 USGS topo map depicted Warrington Airfield's new paved runway in addition to the original unpaved runway. An advertisement for Cornell Aviation Corporation at Warrington Airport (courtesy of Ken Samen). The ad was printed in "Guide to Warrington Township 1973-74 Edition", a booklet produced by the township to promote business & government services. and took my first flight in a Piper PA-28-150 on 1/19/75 at the Warrington Airport with Albert Terry as my CFI. The February 1975 Philadelphia Terminal Aeronautical Chart depicted Warrington as a private airfields having an 1,800' unpaved runway. with several dozen light planes visible. 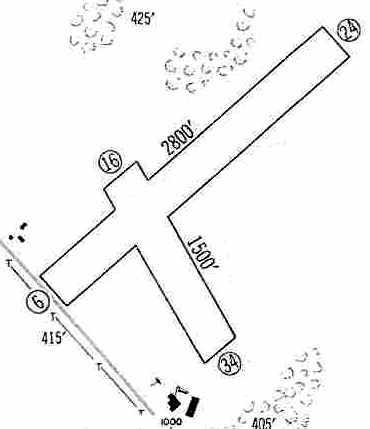 The 1982 AOPA Airport Directory (courtesy of Ed Drury) described Warrington as having a 1,600' asphalt Runway 17/35 & a 1,800' turf runway 15/33. What was previously the field's primary runway (6/24) had apparently been abandoned. The operator was listed as Cornell Aviation. The remarks said, "Limited to single engine aircraft under 2,000 lbs." Warrington was still listed among active airports in the 1986 Flight Guide (according to Chris Kennedy). The 1987 Philadelphia Terminal Aeronautical Chart (courtesy of Gwen Shafer) depicted Warrington as having a 2,300' unpaved runway. (courtesy of Ken Samen of the Warrington Township Historic Commission). It depicted Warrington as having a single paved runway, along with several hangars & light aircraft to the west. depicted a well-used airfield, with a total of over 20 light aircraft, including one twin-engine aircraft. with closed-runway “X” symbols on each runway end, and devoid of planes. 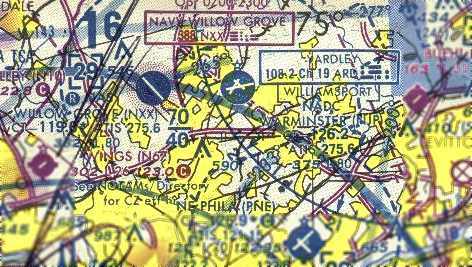 By the time of the 1993 New York Sectional Chart, Warrington Airfield was no longer depicted at all. 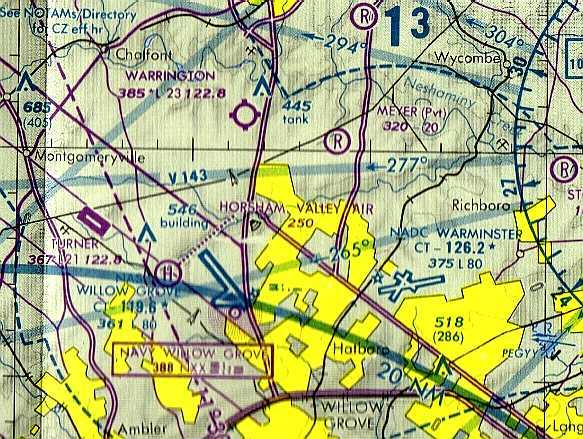 The 2 runways of Warrington Airfield were still depicted on the 1995 USGS topo map. including the Runway “35” markings. 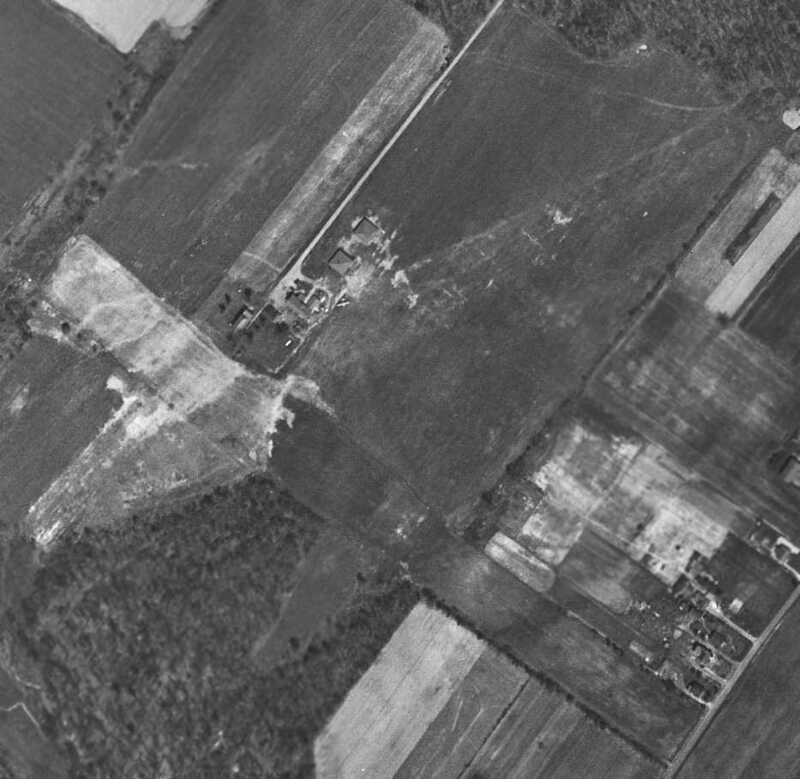 The hangar had been removed, but a house still remained near the former ramp at the bottom of the picture. 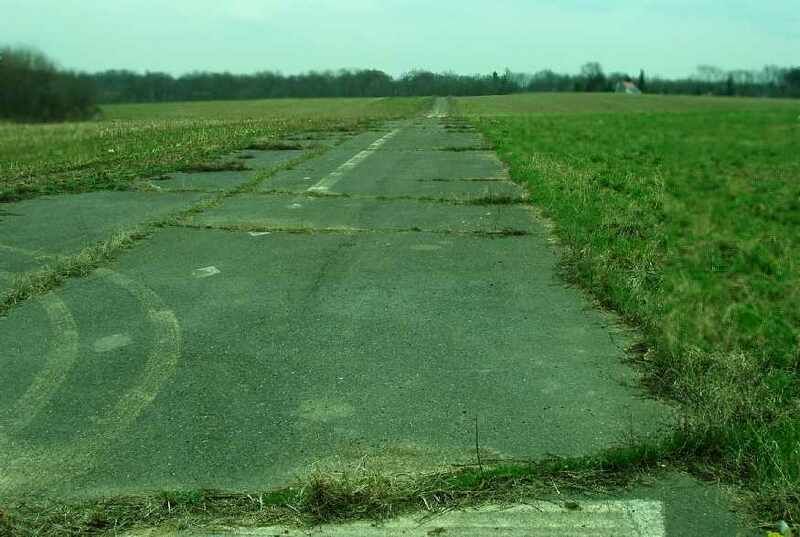 A 2005 photo (courtesy of Ken Samen) looking along the abandoned runway of Warrington Airport. A 2016 aerial view looking northeast at the remains of Warrington Airport. 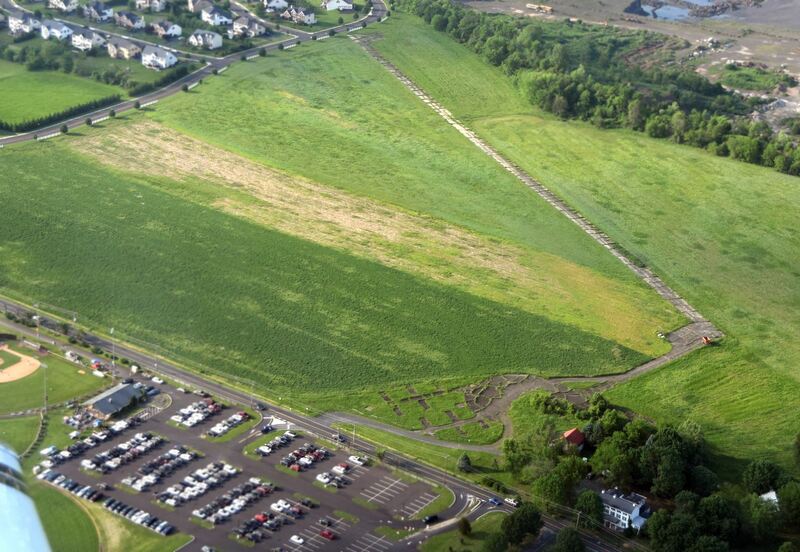 A 5/26/18 aerial view by Tom Doblmaier looking north at the site of Warrington Airfield. 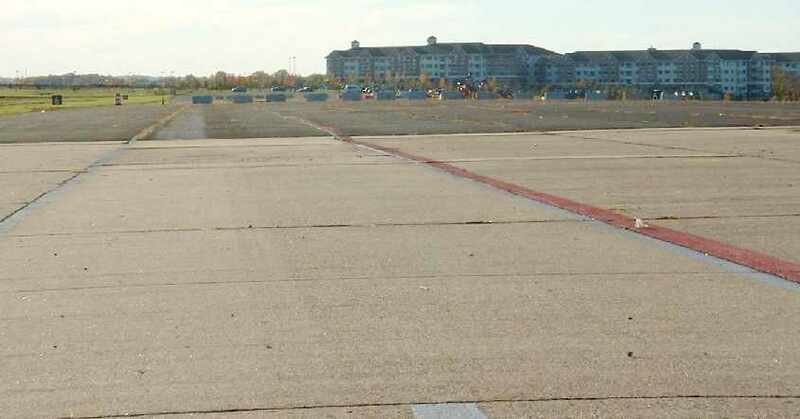 A shame to see this nice little paved runway going to waste. 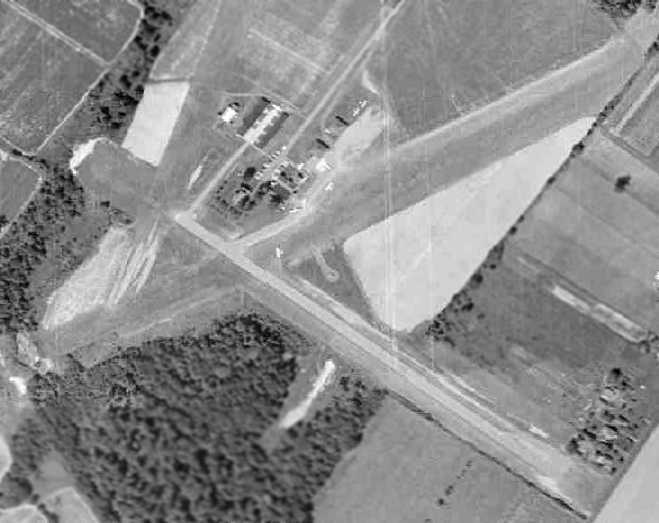 Warrington Airfield is located northwest of the intersection of Easton Road & Bristol Road. Thanks to Greg Bullough for pointing out this airfield. 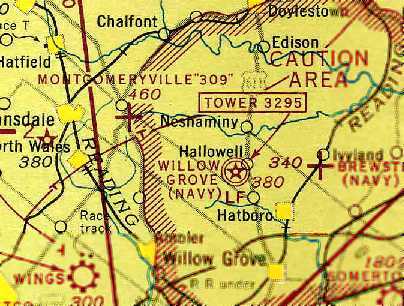 Montgomeryville “309” Airport was labeled on the 1943 NY Sectional Chart (courtesy of Chris Kennedy) as “Montgomeryville '309'”. as it was not yet depicted on the March 1942 NY Sectional Chart (according to Chris Kennedy). The earliest depiction of Montgomeryville Airport which has been located was on the 1943 NY Sectional Chart (courtesy of Chris Kennedy). a reference to Route 309 which ran adjacent to the airport. It depicted the field as an open grass area. 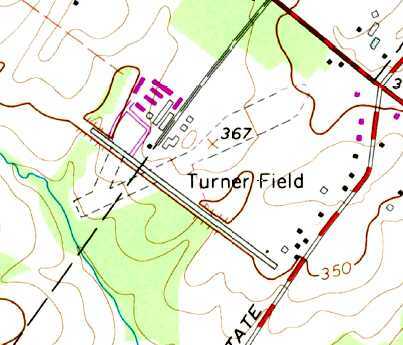 as the 1945 AAF Airfield Directory (courtesy of Scott Murdock) listed the field as “Gloster Field (309 Airport)”. It described the field as a 95 acre irregularly-shaped property within which were 4 sod runways, the longest being a 2,200' north/south strip. The field was said to have a single 70' x 50' metal hangar, and to be privately owned. 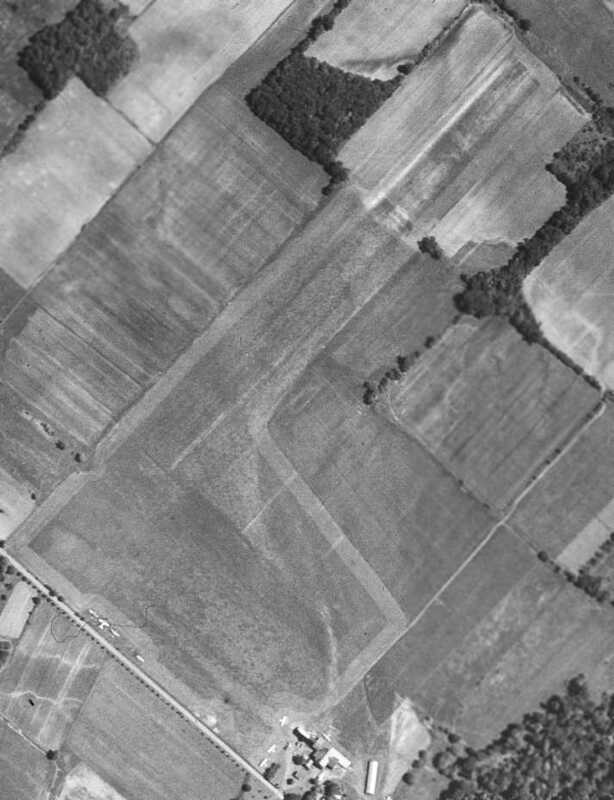 as having a single north/south grass runway, with a checkerboard-roofed hangar on the west side. A total of 5 aircraft were visible on the west side of the field. 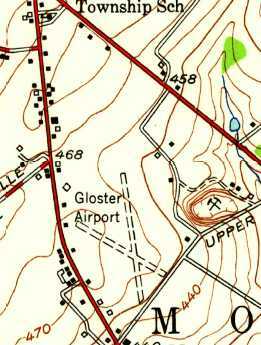 The 1952 USGS topo map depicted Gloster Airport as having 2 unpaved runways, with several small buildings along the southwest side. (the hangar on the east had evidently been added at some point between 1948-58). A total of 6 aircraft were visible on the west side of the field. as that is how it was depicted on the 1961 Philadelphia Local Aeronautical Chart (courtesy of Tim Zukas). It depicted Hi-Line as having a 1,600' paved runway. 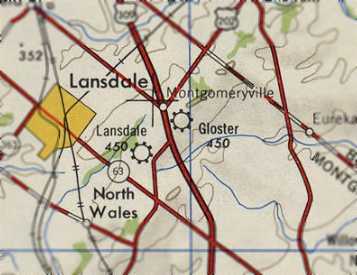 as the 1965 NY Sectional Chart depicted Montgomeryville as having a 2,700' unpaved runway. 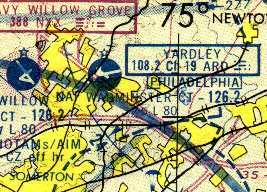 as the 1965 NY Sectional Chart depicted the field as having a 1,600' paved north/south runway. two rows of T-hangars on the northwest side of the field, and another row of T-hangars on the east side. 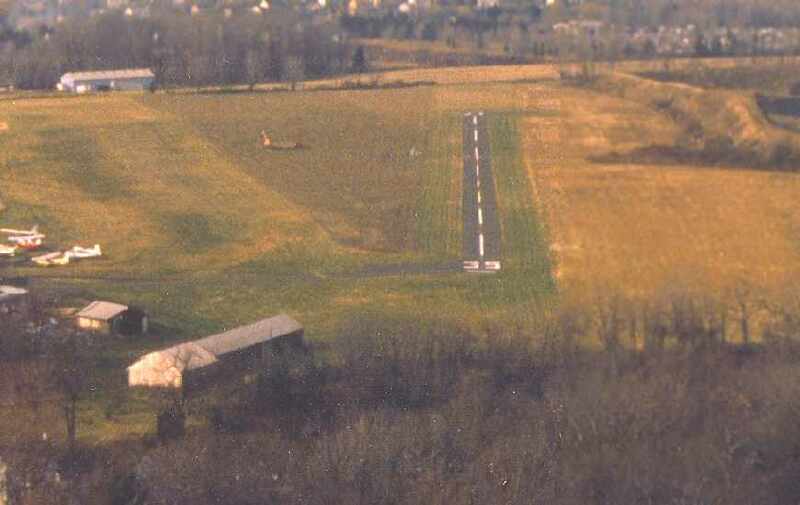 The field had a paved Runway 18/36. including a military surplus Beech T-34 Mentor. 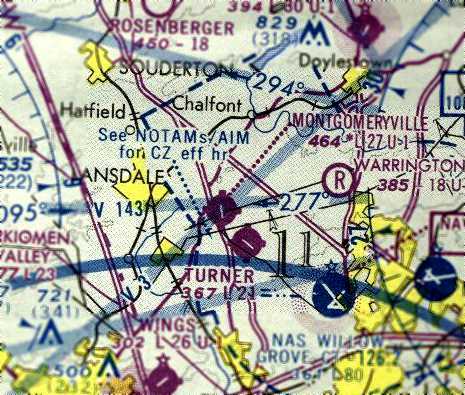 The last aeronautical chart depiction which has been located of Montgomeryville Airport was on the 1975 NY Sectional Chart. 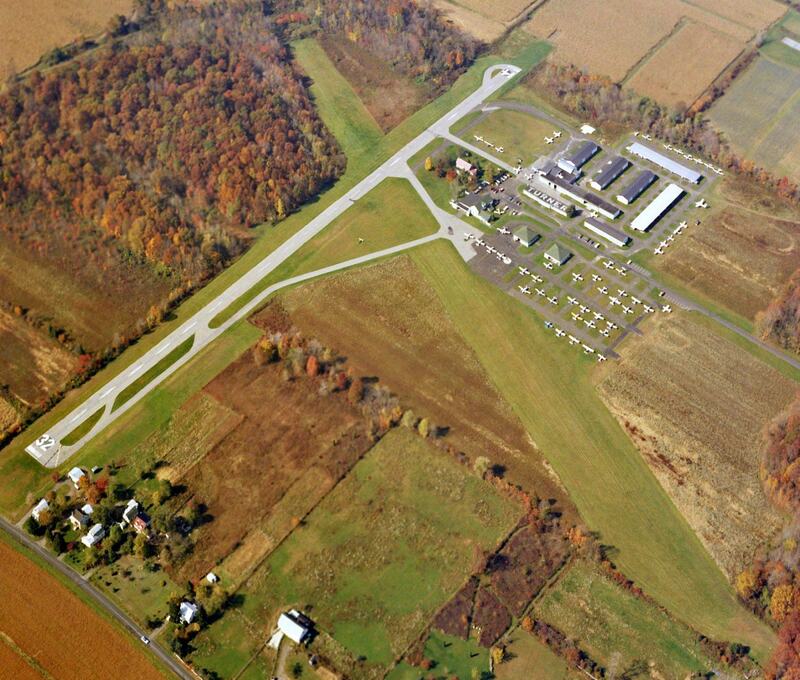 It depicted Montgomeryville as having a single 2,700' paved north/south runway. 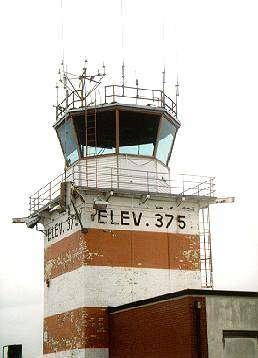 as it was no longer listed among active airfields in the 1980 AOPA Airports USA Directory (according to Chris Kennedy). 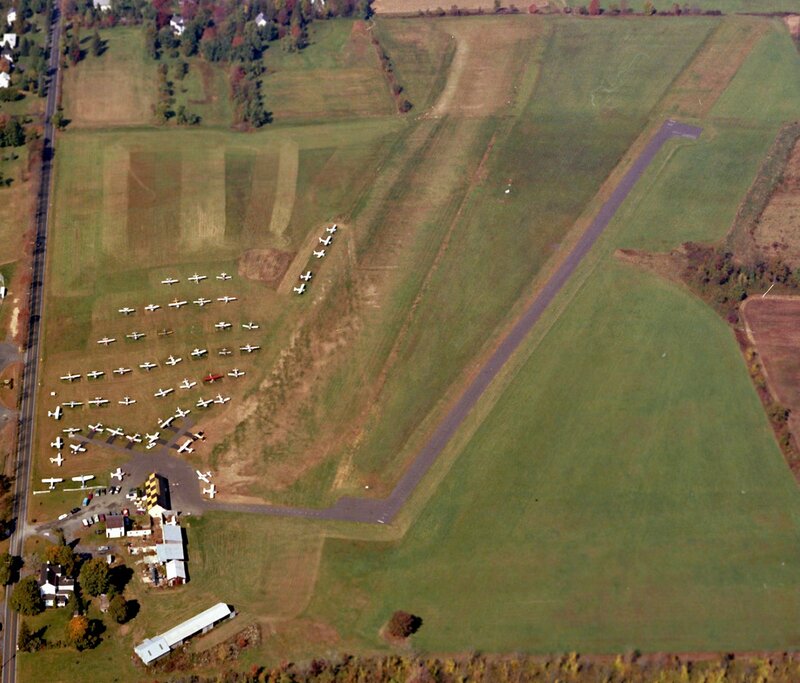 The 1983 USGS topo map showed several large buildings occupying the site of Montgomeryville Airport. the site had been covered by a shopping center. 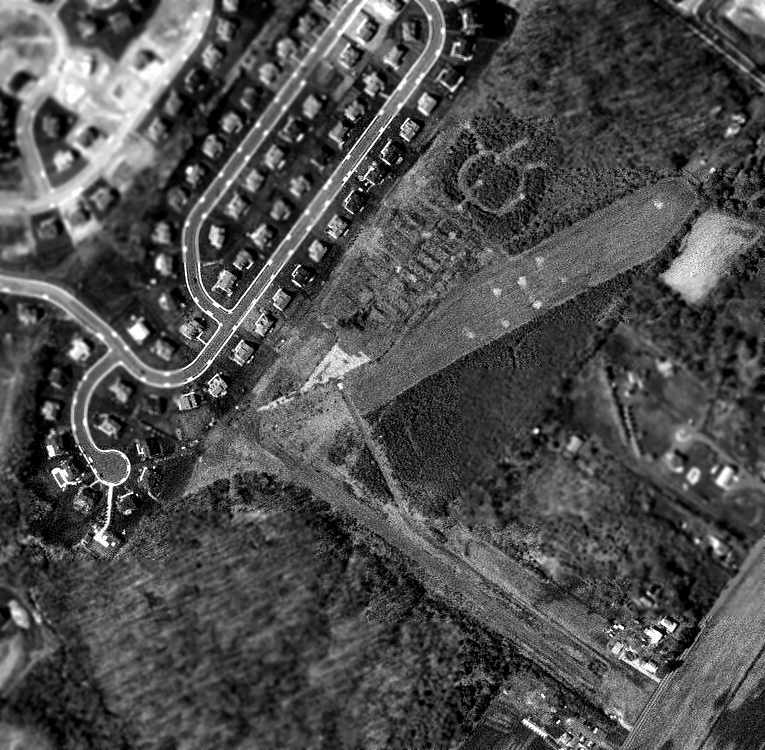 A 2007 aerial photo shows not a trace remaining of the former Montgomeryville Airport. Street maps in 2008 show the southern portion of the former airport property is covered by a shopping center called “Airport Square”. 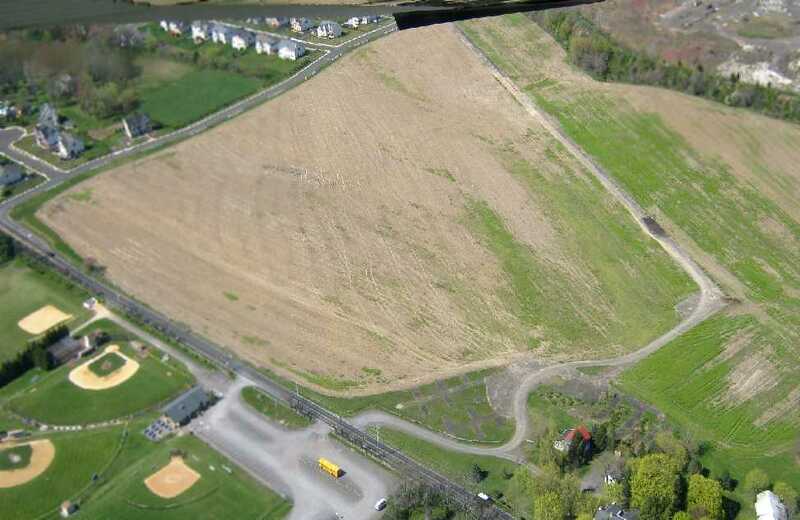 The site of Montgomeryville Airport is located north of the intersection of Route 202 & Route 309. Turner Field (and a large number of other little airports), as depicted on the 1947 NY Sectional Chart. 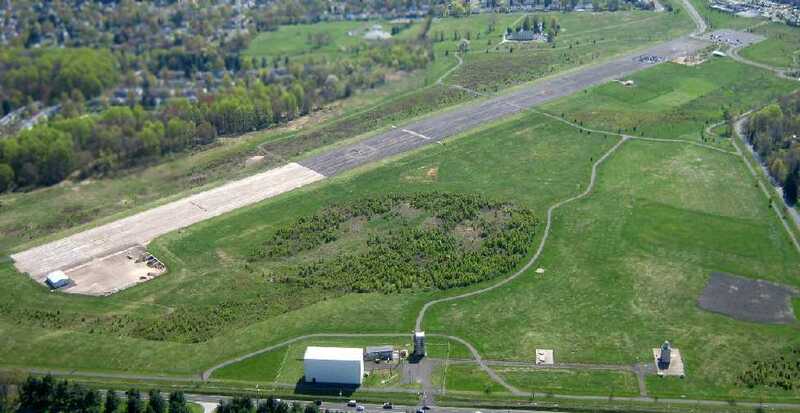 This small general aviation airport was located only 3 miles west of the Willow Grove Naval Air Station. as it was not depicted on the 1945 NY Sectional Chart (courtesy of Norman Freed). The earliest depiction of Turner Field which has been located is the 1947 NY Sectional Chart. The earliest photo which has been located of Turner Field was a 5/2/48 aerial view. It depicted the field as having 3 grass runways, with several buildings & one light aircraft on the north side of the field. 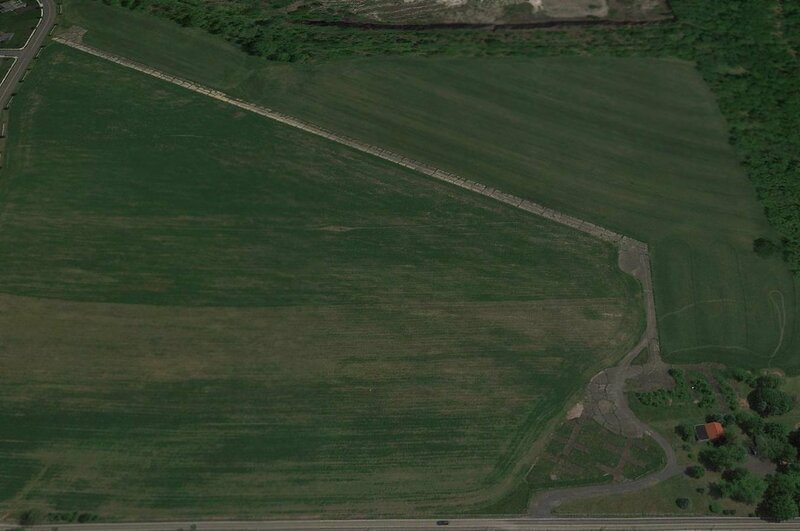 showed Turner to have 3 grass runways, with 2 hangars & 2 other buildings on the north side of the field. 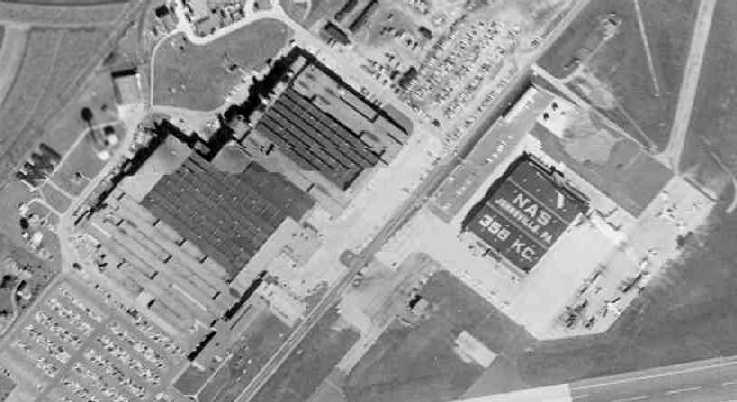 A closeup from the 1949 aerial view of Turner Field (courtesy of Steve Moyer) showing 3 taildragger single-engine aircraft parked near the hangars. described Turner as having 3 turf runways, with the longest being the 2,300' east/west strip. The operator was listed as Arthur Turner. with the primary runway having a 1,700' macadam section within a total length of 2,300'. A 1958 aerial view depicted Turner Field's new paved runway, along with 7 light aircraft. in front of his first Aeronca, at Turner Field. Turner Field, as depicted on the 1959 Philadelphia Local Aeronautical Chart (courtesy of Chris Kennedy). A May 1959 photo by Barie Blizard of a Kellett KC-1A autogiro at Turner Field. 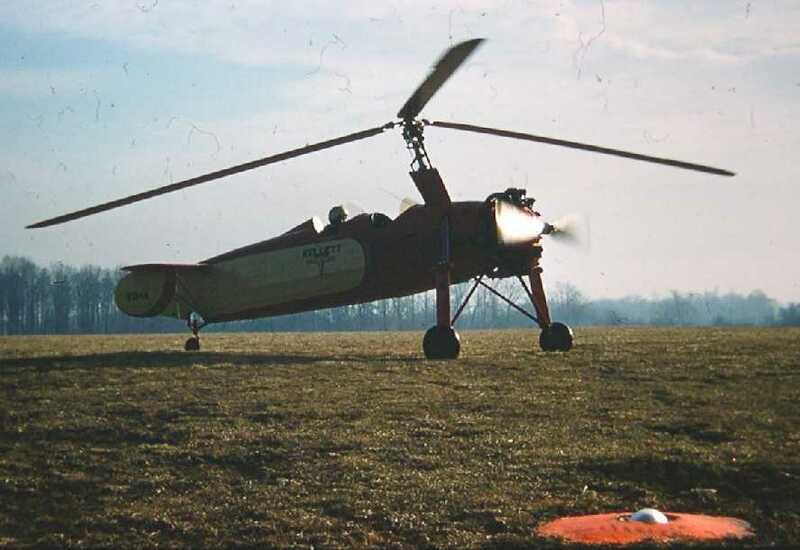 An undated (circa 1959) photo by courtesy of Barie Blizard of a Kellett KC-1A autogiro folded upside the barn at Turner Field. a 2,300 unpaved Runway 7/25, and a 1,900' unpaved Runway 3/21. 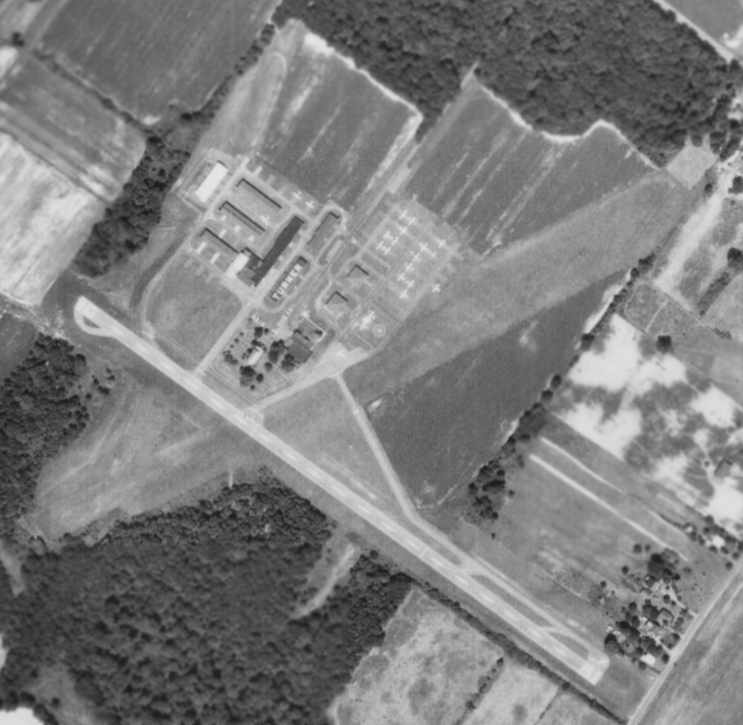 Several hangars were depicted just north of the runway intersection. and listed the operator as A. V. Turner. and was killed on 11/22/62 while flying from Avoca to Turner Field. and recalled that Bud Turner was killed in a crash of his Piper Aztec. but the Aztec was found at 1,500', just short of the crest of a wooded hill." Tom also recalled that Turner Field flight instructor "Jim Frankenfield was part-owner of a homebuilt parasol wing plane." A 1965 photo by Nathan Sturman of an Aeronca 7AC Champion N83618 at Turner Field. Nathan Sturman took his first flying lesson at Turner Field in 1963.
and bicycled the 25 kilometers from my home in Philadelphia to Turner's Field, now closed. It was a long, hot ride through pleasant countryside, with the occasional fright of being chased by an unfriendly dog. I arrived at Turner's Field at about noon. Instructors Ike Blair & Jim Frankenfield were lounging around the living room/office in the white farmhouse. equipped with a 65 hp Continental engine & big funny splashguards above its balloon tires." as having 2 runways, with the longest being a 2,100' asphalt strip. The remarks included, "Runway 3/21 closed." along with an unpaved northeast/southwest strip. 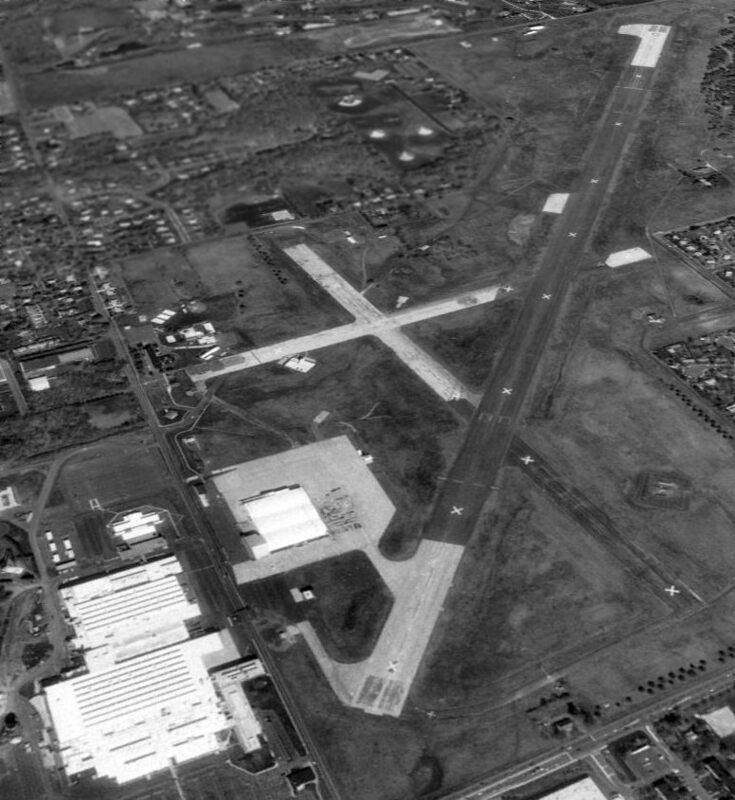 A large number of hangars were depicted north of the runway intersection. which was based there in the 1960s & 70s. An 8/17/71 aerial photo of Turner Field depicted the field as having one paved runway & one grass strip. Over a dozen light aircraft were visible on the field. Turner Field, as depicted on the 1975 Washington Sectional Chart (courtesy of Ed Drury). 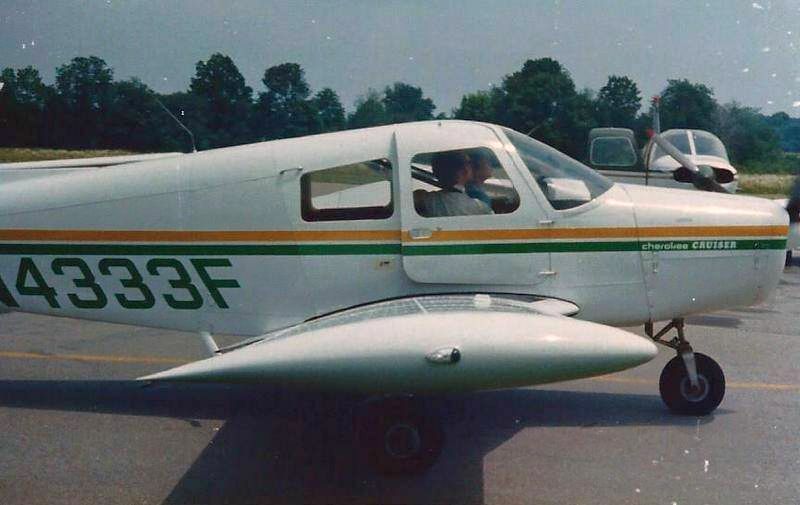 A 1977 photo of Joe Mattern taxiing with his instructor Rich in a Piper Cherokee 140 at Turner Field. The last photo which has been located showing Turner Field in operation was a 10/22/79 aerial view looking west (from the Dallin Aerial Survey Collection, courtesy of the Hagley Museum & Library). The airport was quite well-used, with several dozen light planes visible. The 1986 Flight Guide (according to Chris Kennedy) described Turner Field as having a 2,126' paved Runway 14/32 & a 2,200' turf Runway 7/25. The last aeronautical chart depiction which has been located of Turner Field was on the 1987 Philadelphia Terminal Aeronautical Chart (courtesy of Gwen Shafer). 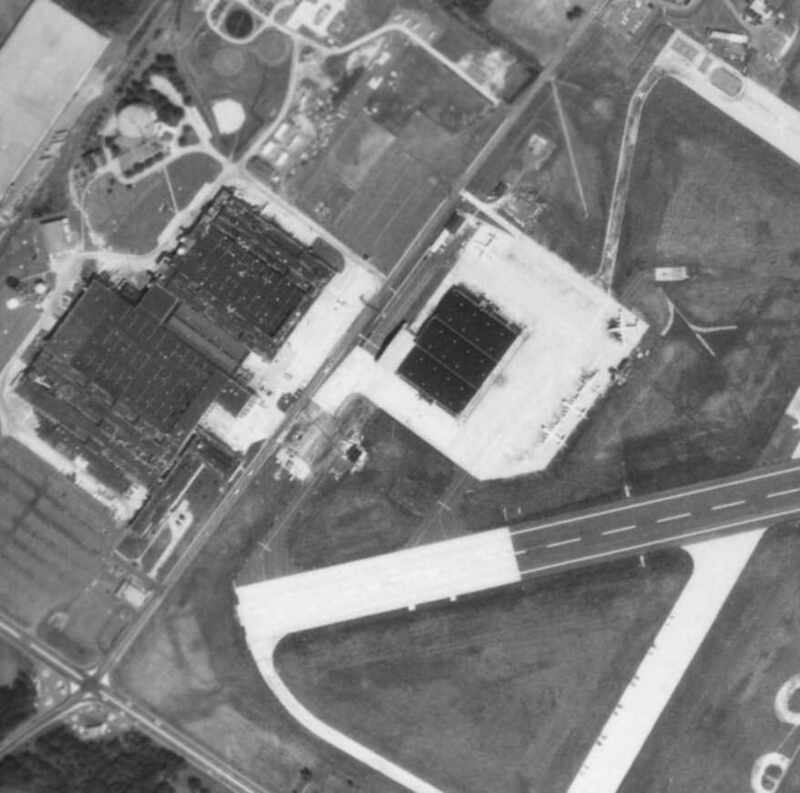 It depicted Turner as having a single 2,100' northwest/southeast runway. According to Bob Zambelli, Turner Field "closed just before I moved here in 1989." which most likely precipitated its closure. 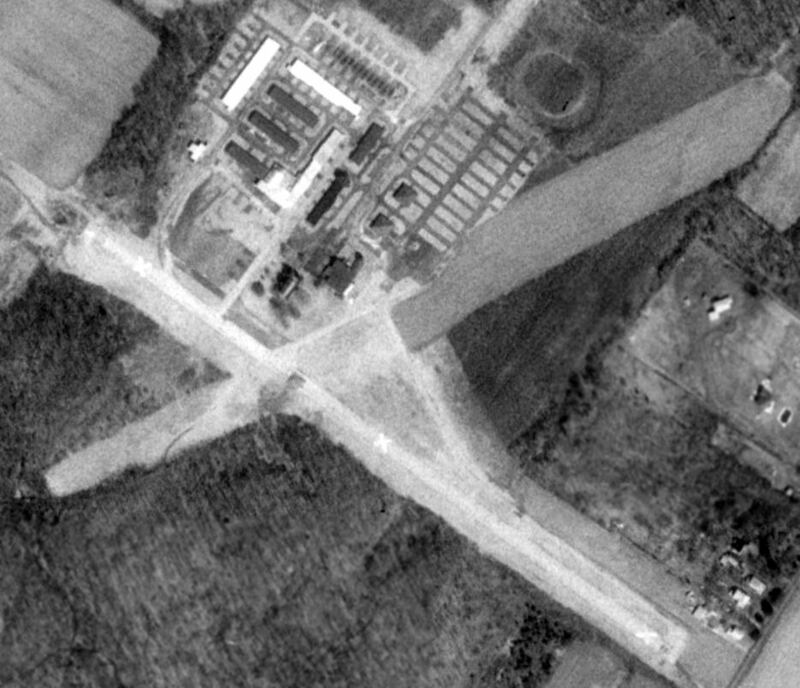 Several hangars were depicted north of the runway intersection. Turner Field had already been closed for several years by the time of a 3/28/92 USGS aerial photo. although numerous individual hangars remained standing. 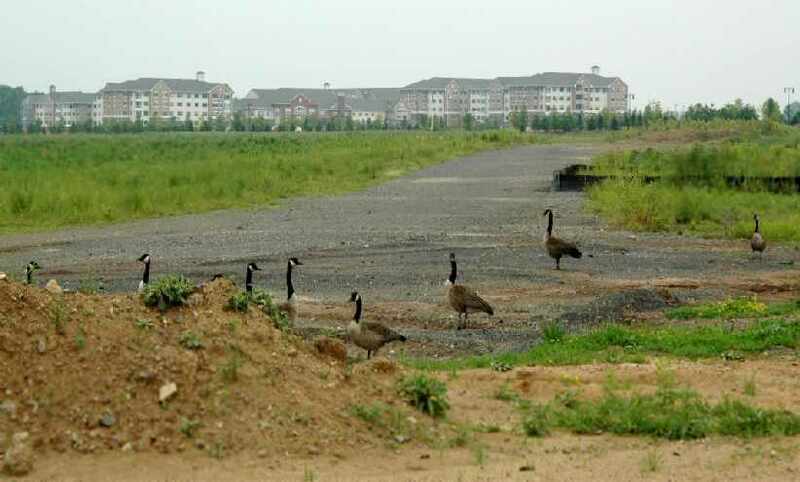 even though the northwestern part of the former airport had been gobbled up by a new housing development. but it appeared as if a small piece of ramp pavement still remained, just north of the former runway intersection. construction having covered the site. Dennis Cooney reported, “We bought the [Turner] house in 2002. A 10/7/11 aerial photo showed no trace remaining of Turner Field. with large numbers of newly-constructed aircraft parked in the foreground. which designed & manufactured military aircraft during WW2. 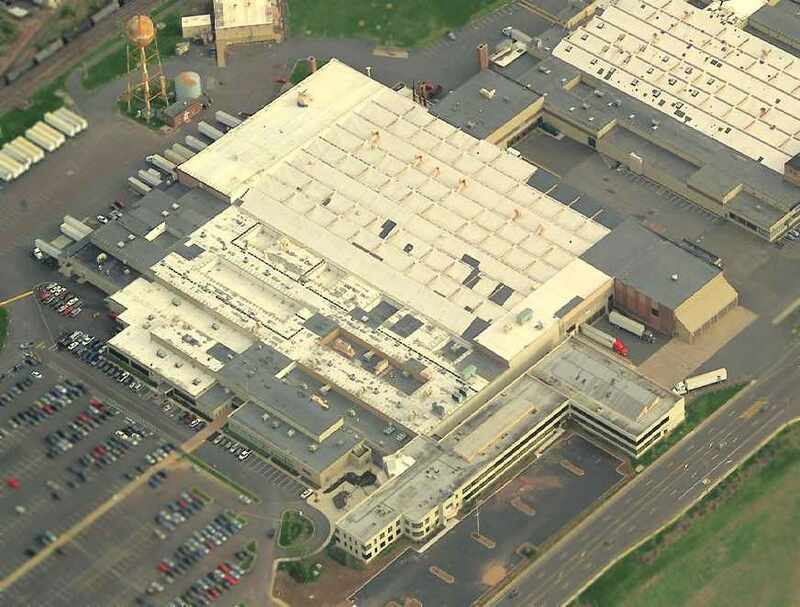 so the company moved to a new site in Warminster, PA in 1941. 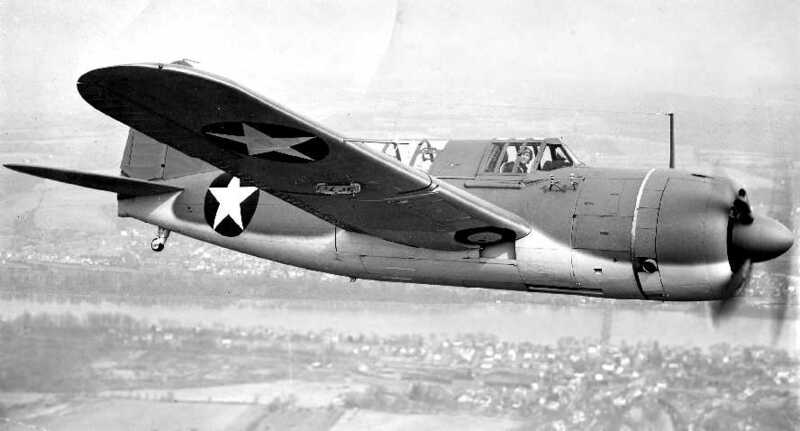 A 1942 US Navy photo of a Brewster F2A-3 Buffalo. Brewster designed & manufactured the F2A-3 Buffalo & SB2A Buccaneer during WW2. 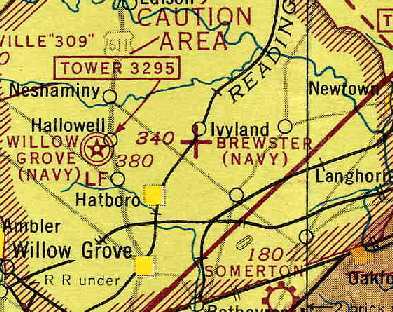 The airfield was labeled as "Brewster (Navy)" on the 1943 NY Sectional Chart (courtesy of Chris Kennedy). was on the 1943 NY Sectional Chart (courtesy of Chris Kennedy). 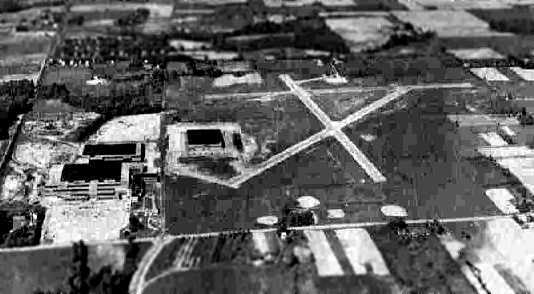 It depicted "Brewster (Navy)" as an auxiliary airfield. 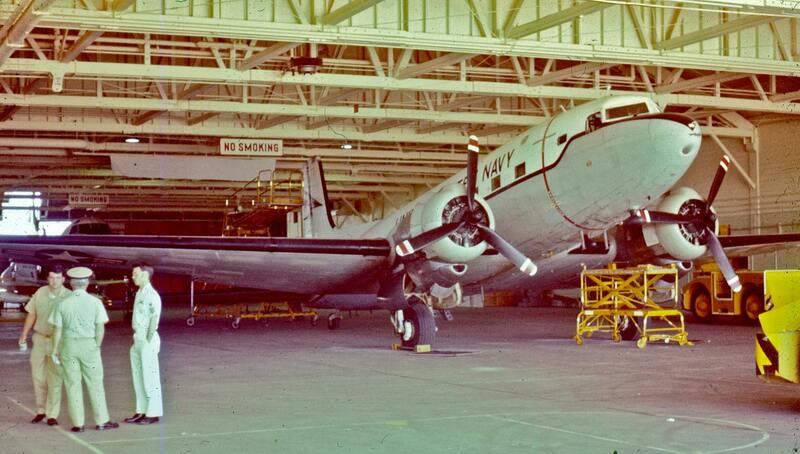 An undated WW2-era view inside the Brewster plant, showing a number of completed F3A Corsairs. which was a license-built copy of the Chance-Vought F4U Corsair. with the former Brewster factory on the west side of the field. A July/August 1943 aerial view of a Brewster SB2A Buccaneer dive bomber, manufactured in Johnsville (courtesy of Tony Coulter). Brewster was a very troubled aircraft company. as it was completely outclassed by contemporary Japanese fighters. Even after switching to licensed production of the Corsair (a very successful design), Brewster still had major problems. and quality control problems were uncovered. which were later traced to poor quality wing fittings. None were issued to front-line combat units. so serious that the Navy actually took control of the plant briefly. Because of this it was known derisively as "the Bucks County Playhouse". After its takeover by the government, the Brewster plant was eventually closed. 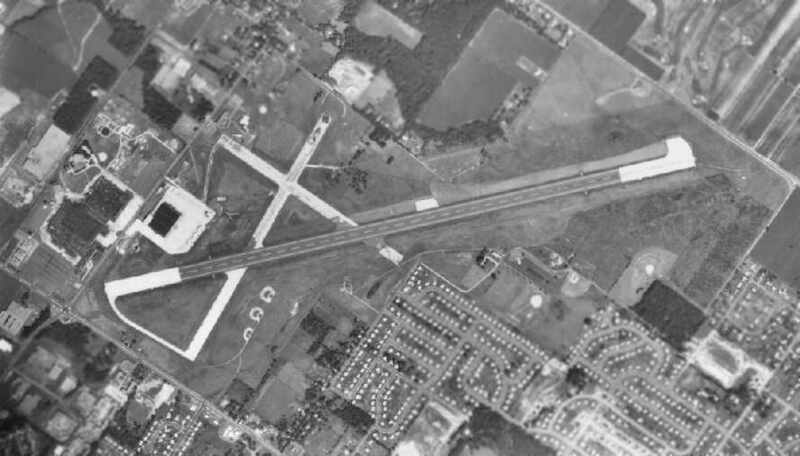 Following the closure of Brewster, the Warminster facility became a USN base in 1944.
depicted the field as having 3 paved runways, with the Brewster factory buildings on the west side. as a 300 acre rectangular property within which were 3 seal-coated runways, the longest being a 3,200' east/west strip. The field was said to have three 280' x 100' brick hangars, and to be privately owned & operated. An undated USN photo of a Grumman F6F-5K Hellcat at NADC Johnsville (courtesy of John Voss). An undated (circa 1940s-50s?) photo (courtesy of John Allen) of the Warminster ramp. and several rows of what look like F6Fs with very little markings. I was told they were early drones flown from the back of the PB-1s. It was taken from the control tower area, looking toward Jacksonville Road. I came across it on a wall in a tool shop back in 1979. 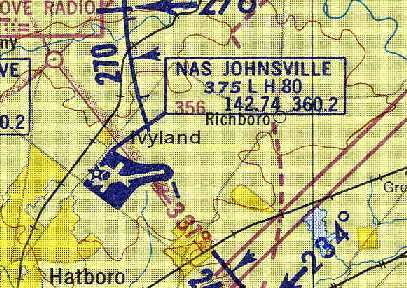 The field was labeled as “Johnsville NAF” on the 1947 USGS topo map. 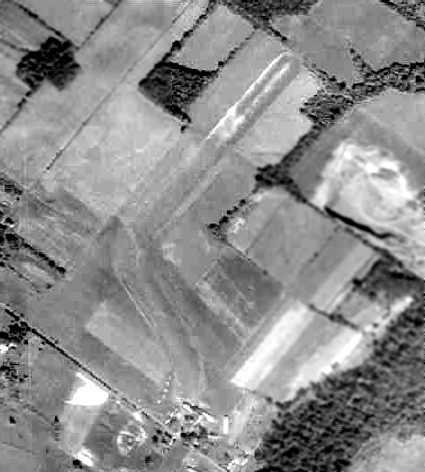 A 1948 aerial view depicted the field in its WW2 configuration, with 3 relatively short runways. A total of 6 aircraft were visible on the northwest ramp, most larger multi-engine aircraft. 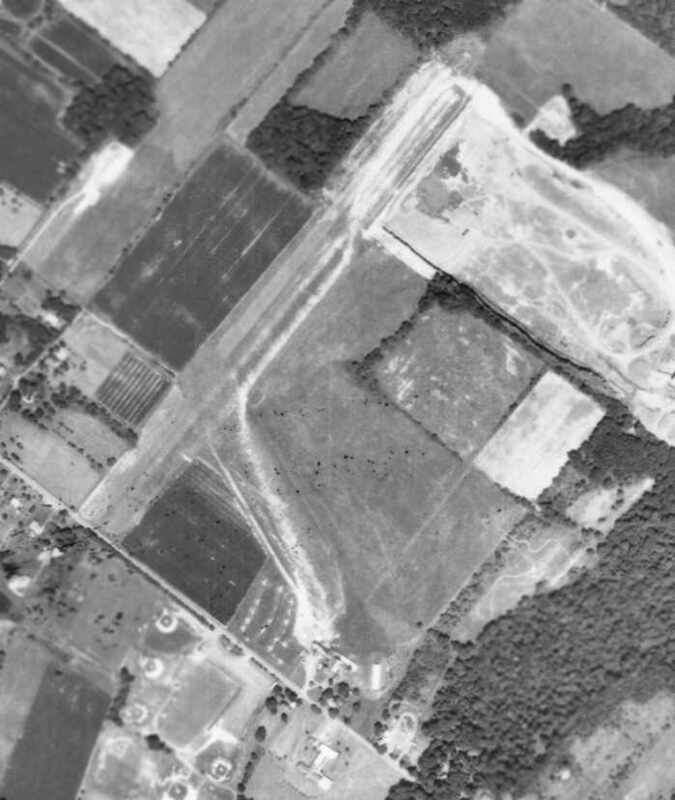 A 1950 aerial view still depicted the field in its WW2 configuration, with 3 relatively short runways. 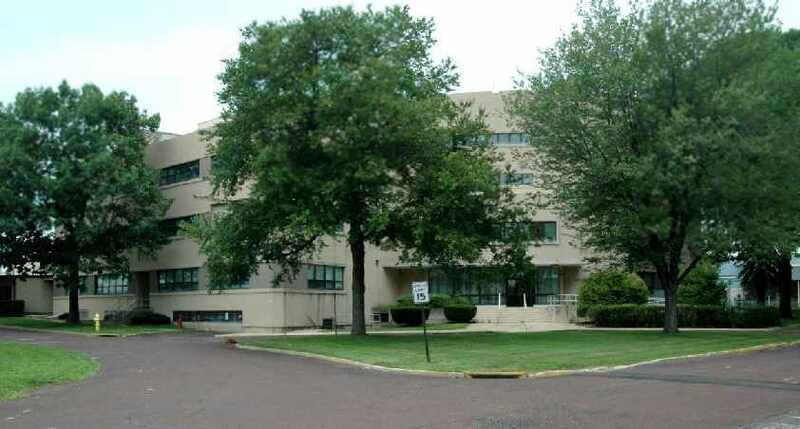 After the end of WW2, Warminster eventually became the headquarters of the Naval Air Warfare Center. including what was in 1952 the world's largest human centrifuge. Bob Supina recalled, “In the early 1950s I grew up in the village of Penns Park. My Father worked at the Johnsville Naval Air Development Center (Warminister). Penns Park was inside the 8 mile radius of NADC, so Navy planes mostly stayed in their airspace. My Father was Supervisor of the building of the first guided missiles, the Gorgon. The Gorgon was the Grandfather of the cruise [missile]. We used to see the drones fly over head. The drones were painted red & my Father told us that they were radio controlled. On occasion, at night a plane would fly over with a brilliant search light in the belly. It would light up the entire area like daylight. For some unknown reason, the Navy had a dump on the outside of the fenced compound. “U.S. 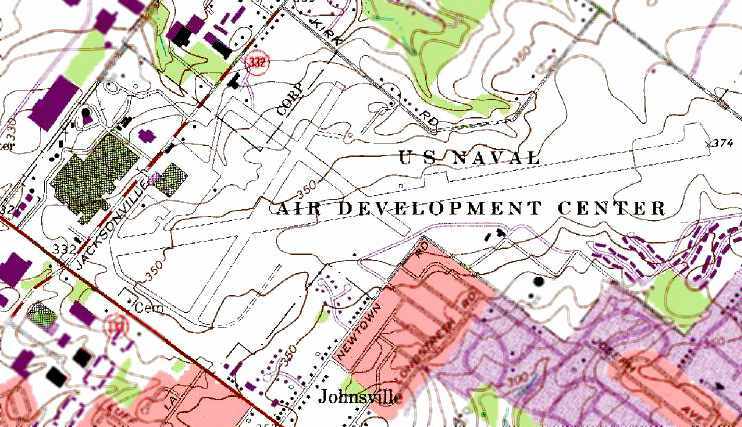 Naval Air Development Center”, as depicted on the 1952 USGS topo map. testing a new Air Force space suit in the Johnsville centrifuge. An undated (circa 1950s?) view of the interior of the Johnsville centrifuge. described "NAS Johnsville" as having an 8,000' paved runway. 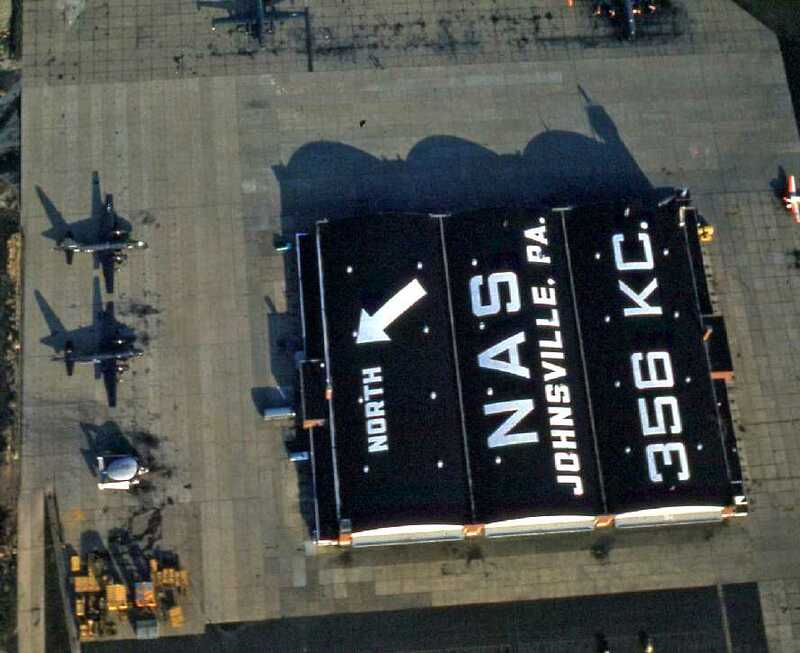 A 1958 aerial view depicted the hangar painted with “NAS Johnsville PA 358 KC”, with a variety on aircraft parked on the ramp. as having 3 paved runways, with the longest being an 8,000' east/west runway. 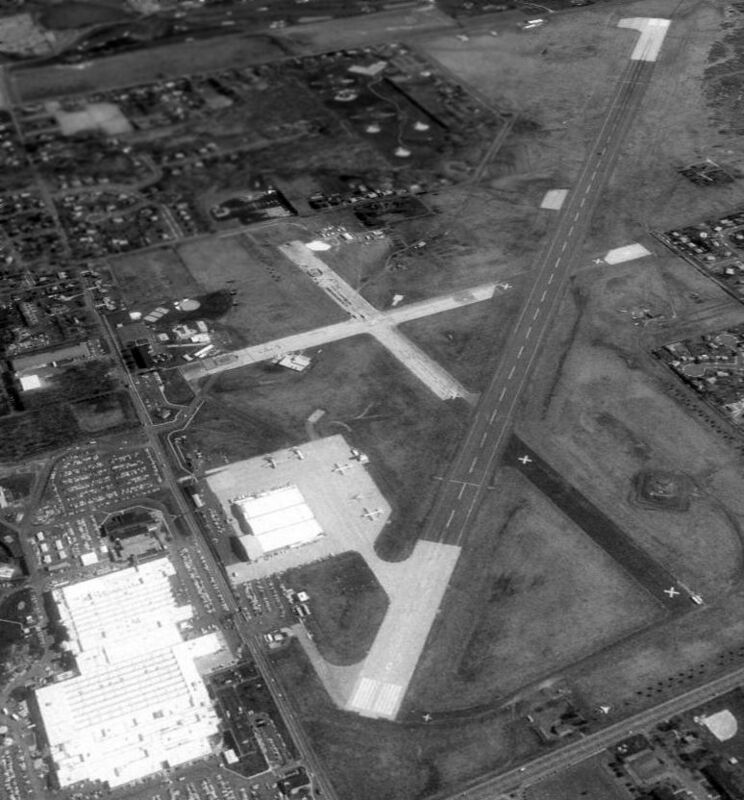 A circa 1960s aerial view of the NAS Johnsville hangar, along with several P-2s, an E-1, and other aircraft. 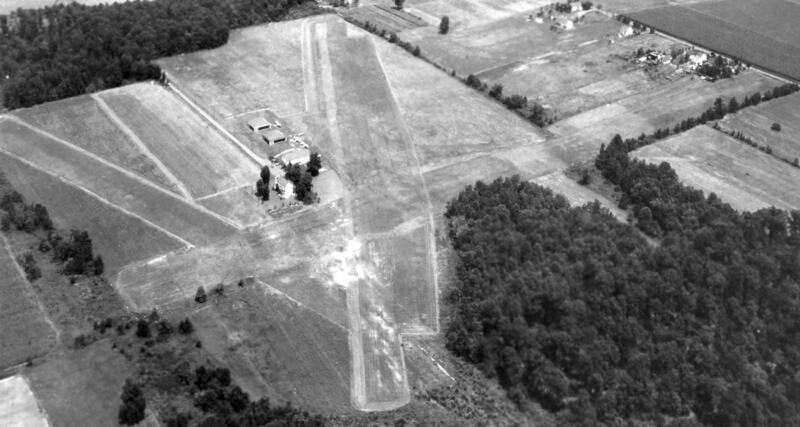 A circa 1965 aerial view by Jack Kenton looking north at NAF Johnsville. 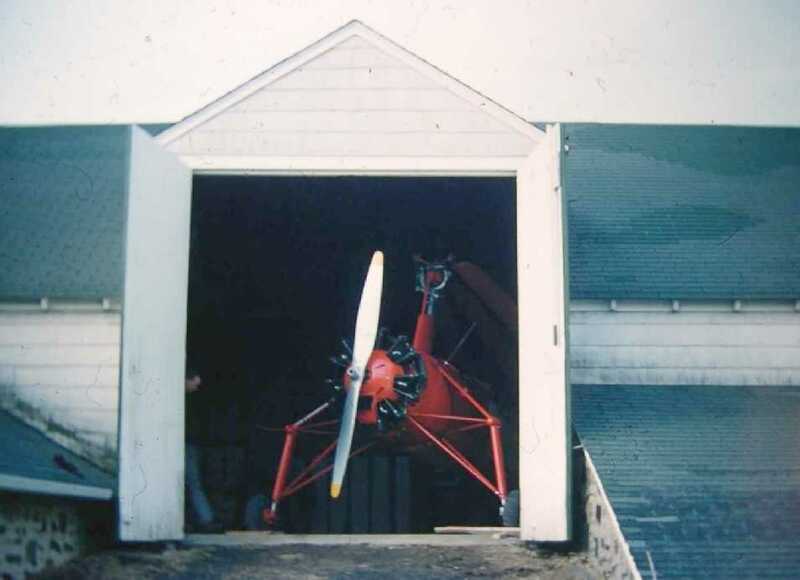 A circa 1967 photo by Jack Kenton of a Douglass R4D inside an NAF Johnsville hangar. 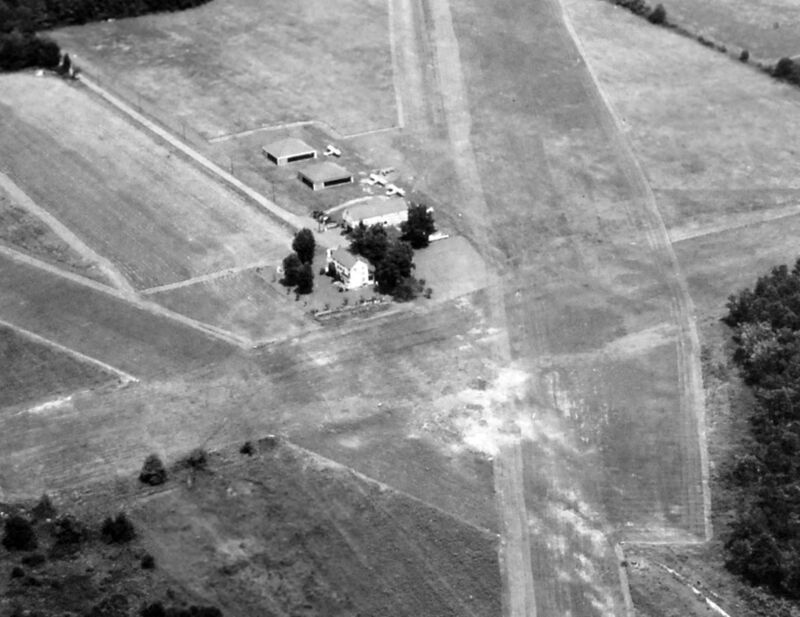 A 1967 aerial view by Jack Kenton looking east at NAF Johnsville. Jack Kenton recalled, “Normal traffic pattern would not have you in this position for landing on Runway 09. When I was there (1964-68) the only usable runway was 09/27. By 1967, we had taken to parking our NC-121 Constellation on the closed runway to the left. A circa mid-1960s aerial view of Warminster (courtesy of Harry Kidd). A lucky boy in the cockpit of a Grumman Cougar, at the 1965 Warminster Open House (courtesy of Harry Kidd). 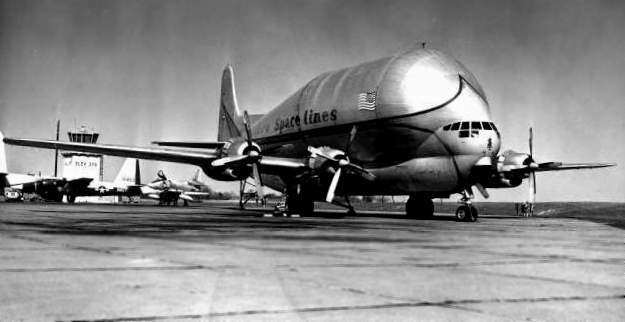 An Aero-Space Lines Super Guppy at Warminster in the 1960s (courtesy of Harry Kidd). A circa-1960s photo of a RA-3D Skywarrior, in markings from NADC Johnsville (courtesy of Harry Kidd). 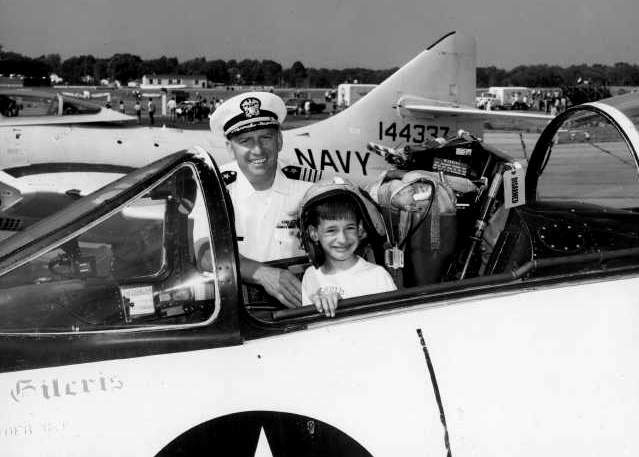 Emil Di Motta recalled, “I had the good fortune to be stationed at NAF [Johnsville] as a project pilot from March 1966 until I left the Navy 10/1/68. A 1968 photo of a Douglas NRA-3A Skywarrior at NAS Johnsville. 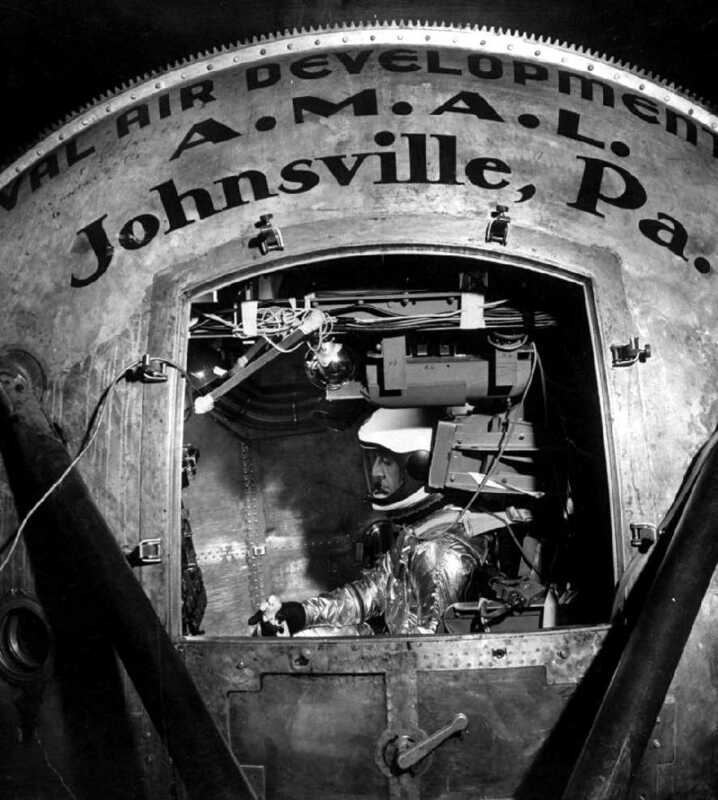 A circa 1969 photo of James Frankenfield in a research cockpit inside the Johnsville centrifuge. and investigating the 'tuck-under' recovery of the Boeing 720 in severe turbulence (I did better on this one). We at Turner were teaching Don Morway, who worked in the centrifuge, and his dad, toward their Private Pilot Certificates. And so Don would invite me & the instructors at Turner over to 'fly' the centerfuge. Lots of fun! however, releasing the controls too soon would allow continuation of the spin, conversely, holding too long & the spin would reverse itself, and go in the opposite direction. with the 'shake' becoming more severe as we went, simulating clear air turbulence, until it became difficult to even focus on the panel. Emil Di Motta recalled, “The F-4 project in the centrifuge... I was one of the first 'thrill seekers' to take that project for a spin. They had 4 cameras taping everything that I did. After the familiarization spin watching & just flying, they turned on the tape for me to see what was going to happen. I gave them a thumbs up & started the run. My plan was to stop the flat spin & then recover. It’s amazing how fast you can fall from 50,000 feet! I used full rudder & pulled one engine back to flight idle & afterburner on the other to stop the spin. That’s when I hit the water (Chesapeake Bay). I spun for another 5 or 10 minutes & asked to do it again. The actual tape ran for a little over 90 seconds. I got into about 16 seconds of the 2nd ride & grabbed the ejection ring between my legs which killed the tape. a tenant command at The Naval Air Development Center (NADC) in Warminster. To the locals, the base was simply called 'Johnsville', but within the Navy lexicon, the word 'Johnsville' did not exist. either when Brewster developed the land or in the post-WW2 runway extension. 'Warminster' was a township, albeit a very rapidly growing suburban township of Philadelphia. but just shopping centers & suburban sprawl (which would later doom the facility). because the base was bisected by [Jacksonville] Road. and to the east of [Jacksonville] was NAF with the runway, hangars, a barracks, a chow hall and of course the aircraft. Probably 95% of the staffing of NADC was civilian, with the reverse being true at NAF. Practically speaking, NAF existed only to serve NADC. We had no other organizations on board that might utilize the airfield - no reservists, no flying club, etc. Those were all a few miles down the road at NAS Willow Grove. The bifurcated command structure gave the Navy some choice (and duplicated) billets for senior officers - 2 CO's, 2 XO's, etc. Bob continued, “In 1970 we had 21 aircraft on board representing 14 types. Every aircraft was either 'N'- designated (no longer able to perform its designed mission) or 'X'-designated (experimental). The birds served as project platforms, and nothing more. Our projects ran the gamut - from aerial measurement of ice depths to ECM. and designed & tested the system adopted by the Army to drop sensors along the Ho Chi Minh Trail. created by upgrading Naval reserve squadrons to the P-3. We converted the Neptunes, repainted them & lettered them for the US Army. Droning was another specialty - we made up F-4 drones & P-2V drone controllers from retired aircraft. Finally, AMRD had a strong presence in human factors engineering, including ergonomics & cockpit design. (example: the EC-121C Super Constellation - we had 2 of them). We had the last flying early model A-4s & F-4s. Parts supply was a nightmare, as was qualified mechanics & pilots. Occasionally type-qualified pilots had to be borrowed from active duty squadrons & put on TDY with us. Bob continued, “Even in 1970, I felt that the handwriting was on the wall for NADC. NADC at Warminster and WST (Weapons System Test) at Patuxent River. We NEVER, by the way, were authorized to keep any ammunition on base or to use the aircraft's weapons systems. The only ammo in the base's bunker was 0.22 & 0.45 caliber for the base pistol team, of which I was the team captain. We could not even land aircraft that had weapons on board. Flight ops were conducted on weekdays only & probably averaged 6 landings & takeoffs per day. On many days there were no flight ops at all,and a dozen takeoffs & landings marked a very, very busy day. and mainly because we didn't need to fly at those times. Aircraft that were delayed beyond our securing time usually diverted to Willow grove or occasionally to MC Guire AFB. We almost lost the base pistol range due to a FOD scare. An 8/7/71 aerial view of Warminster, showing the single east/west active runway, as well as the 2 other abandoned runways. A closeup from the 8/7/1 aerial view of Warminster, showing what appears to be 4 P-3s & a C-130 on the ramp. the Navy's Anti-Submarine Warfare platform used from the stern helipads of D & DE class ships. 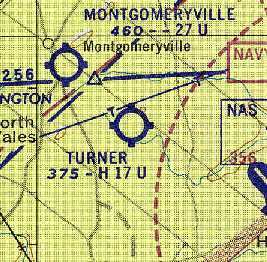 NAS Warminster, as depicted on the 1975 Washington Sectional Chart (courtesy of Ed Drury). 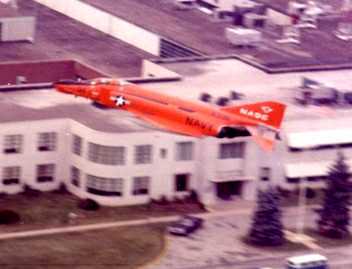 An undated (circa 1970s) photo of a bright red QF-4B Phantom in NADC markings passing low over the former Brewster factory. A February 1983 DOD photo of a A3D-1P Skywarrior at NADC Johnsville. 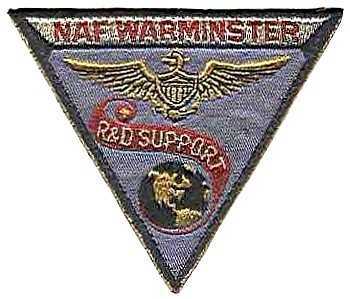 An undated patch for NAF Warminster R&D Support. The 1987 Philadelphia Terminal Aeronautical Chart (courtesy of Gwen Shafer) depicted NADC Warminster as having 3 paved runways. as well as the former Brewster factory. An August 1990 photo of Vought F-8K Crusader serial #417, a Warminster gate guard. 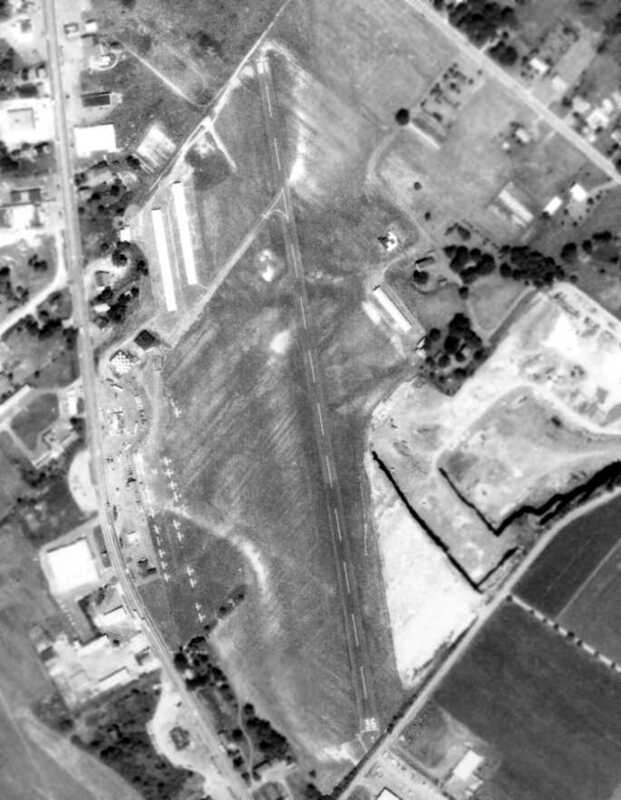 A 4/13/92 USGS aerial view looking northeast at Warminster, shortly before the base's closure. Note the 4 P-3s on the ramp. 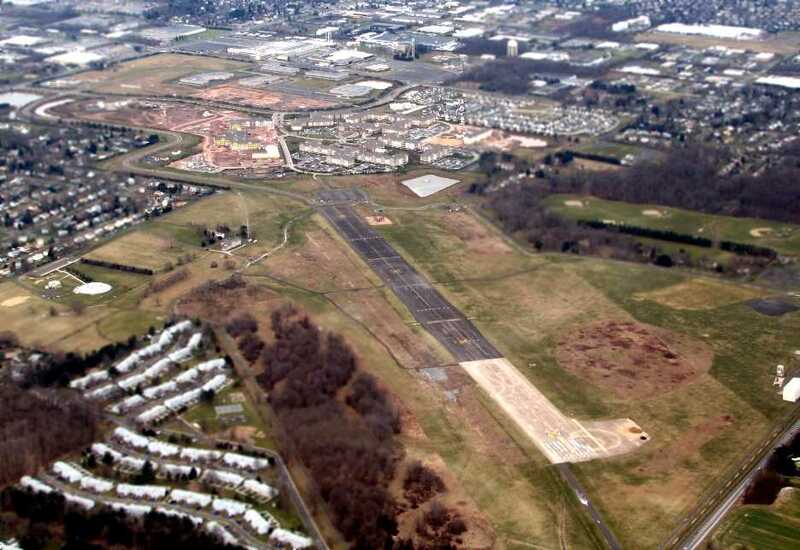 depicted Warminster as having 3 paved runways, with the longest being 8,000'. 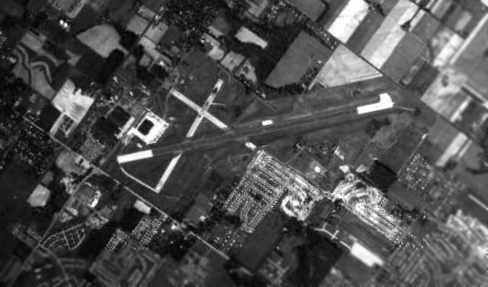 The last photo which has been located showing Warminster while still an operational airfield was a June 1993 DOD photo of a P-3 Orion at Warminster, used for laser testing. A 1994 photo by Christopher Ness of an F/A-18 Hornet mounted inverted on an antenna test mount at Warminster. The airfield layout of NAWC Warminster, from a 1994 airport directory. 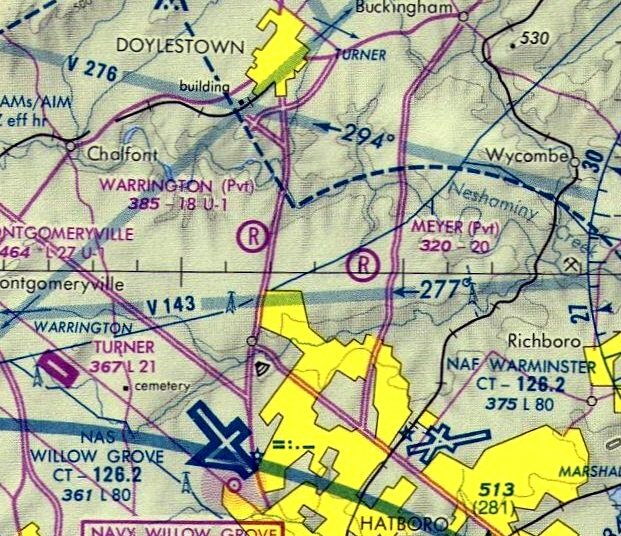 "Warminster (NAWC)" was still listed among active airfields in the 1995 Jeppesen Airport Directory. along with the 2 shorter paved crosswind runways (which had been abandoned). with NAWC moving to Patuxent River NAS. at the great Warminster Naval Air Research Center. to a remote central station alarm system, because there were no workers, just us armed government guards. the g-force room, the astronauts' training areas, the GPS development areas, the indoor research submarine, etc. The place was so amazing & spooky, it was as though the 2,600 workers got up one day & went home never to come back. The bowling team pics, the desks, some family photos, all the department signs, the super high security devices etc. were still standing. The lockers had many, many Vietnam-era Navy decals. that I thought I was in a Pearl Harbor movie." but it was labeled "NAWC Warminster (Closed)". At the time of its closure, the only runway still maintained was 8,002' Runway 09/27. 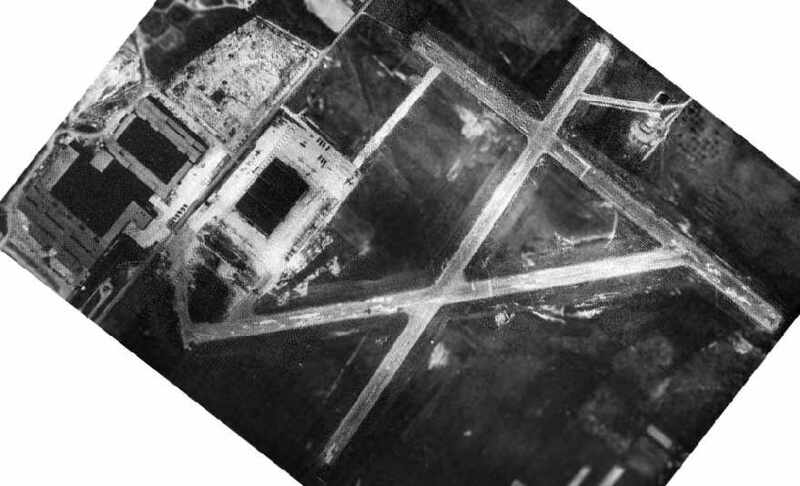 Two other paved runways still existed, along with taxiways, a ramp & a large hangar. 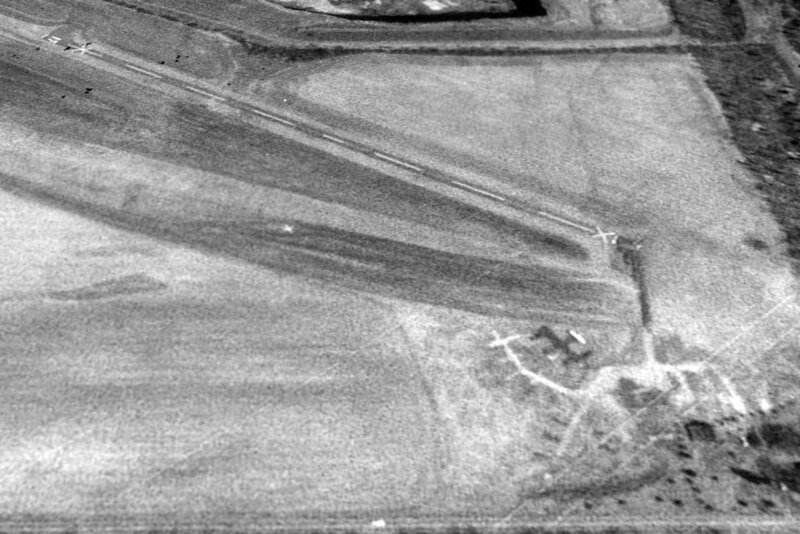 The last photo which has been located showing the Warminster airfield as largely intact was a 4/23/99 USGS aerial view looking northeast. 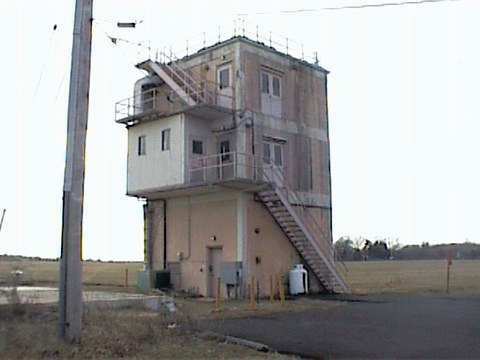 The Warminster tower, shortly after the base's closing. Photo by Bob Greenwood. 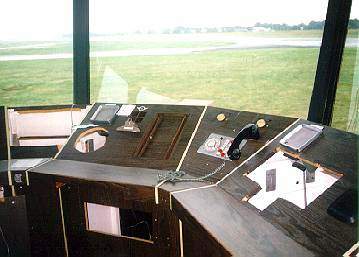 The consoles inside the Warminster tower, stripped of their equipment, shortly after the base's closing. Photo by Bob Greenwood. pictured during its demolition in 2001.
although some of the northern portion of the former southeast/northwest runway had been removed. The local government planned to reuse portions of the base's office facilities as the "North American Technology Center". Other large office buildings were demolished in 2001.
it would have made an excellent reliever airport for the Philadelphia area. But it would make more sense to tear down all of that paid-for infrastructure, right? Three hangars that had been on the site since it first operated as a manufacturing plant for Brewster were never even considered a candidate for subleasing. Their wooden structure was categorized as a fire hazard & were torn down in 2002 to make way for Ann’s Choice retirement village. 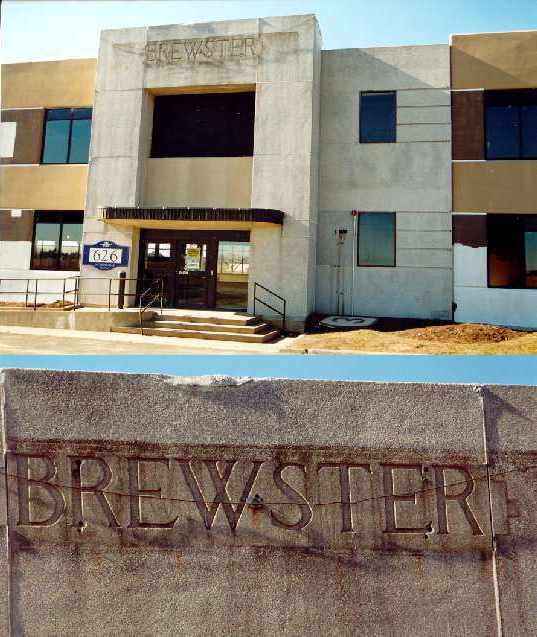 Two April 2002 photos by Willim Dougherty of the Brewster lettering on the former Brewster factory building. which was then removed, revealing the original lettering. According to local pilot Tom Kramer, "It will never again be used as an airport. The runway destruction has begun. As of about a month ago , there were huge sections already dug up. 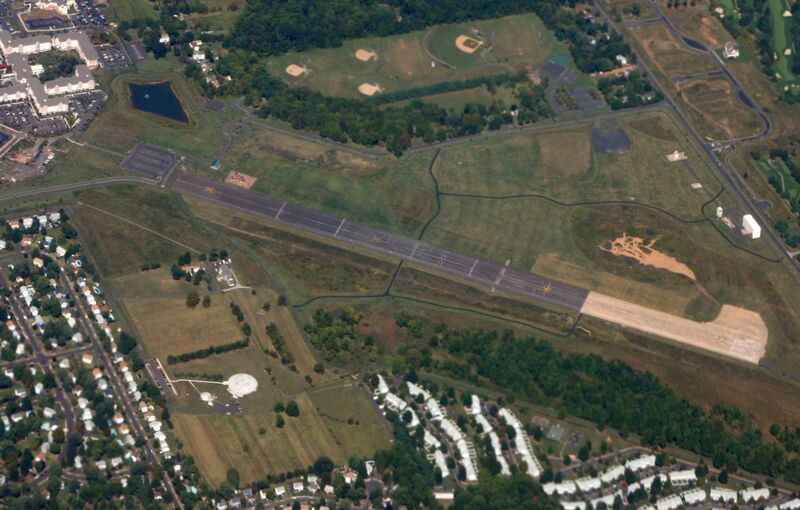 and over to South Jersey Regional Airport in NJ & the Air Victory Museum where it resides today." 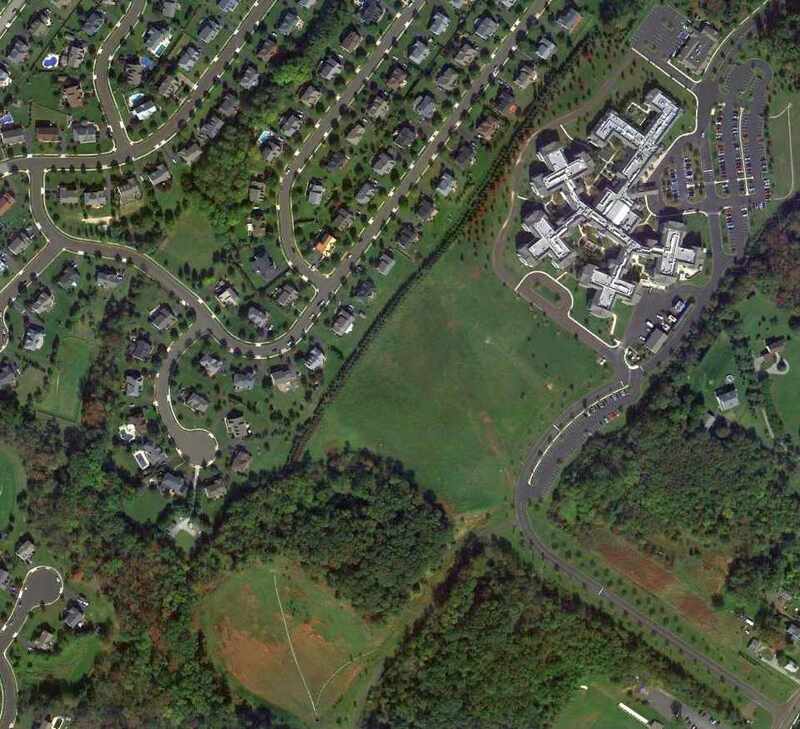 "As of now, the site is the home to an office complex, a park, and a retirement community. I understand it is no longer the North American Technology Center. All the buildings were gutted & refurbished as office buildings. The south borders of fencing have been removed. The runways, taxiways, and control tower have all been completely demolished. The terrain has also been recontoured. A new road (Johnsville Boulevard) has been constructed connecting Street Road & Jacksonville Road. The site is still the location of the Doppler 10,000 radar. and the Ann's Choice retirement community." 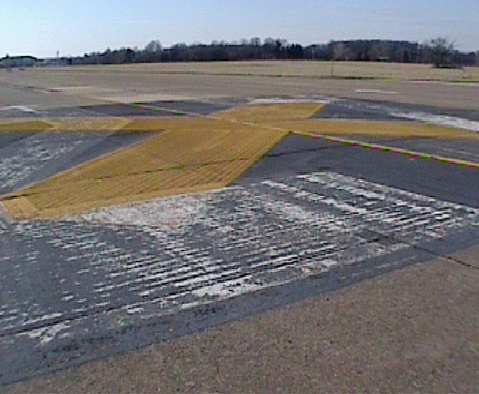 A 2004 photo of a closed-runway "X" symbol on a remaining segment of the former Warminster runway. 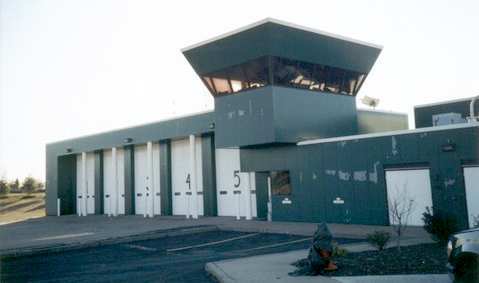 A 2004 photo of the former Warminster fire/rescue garage, now reused to hold ambulances. 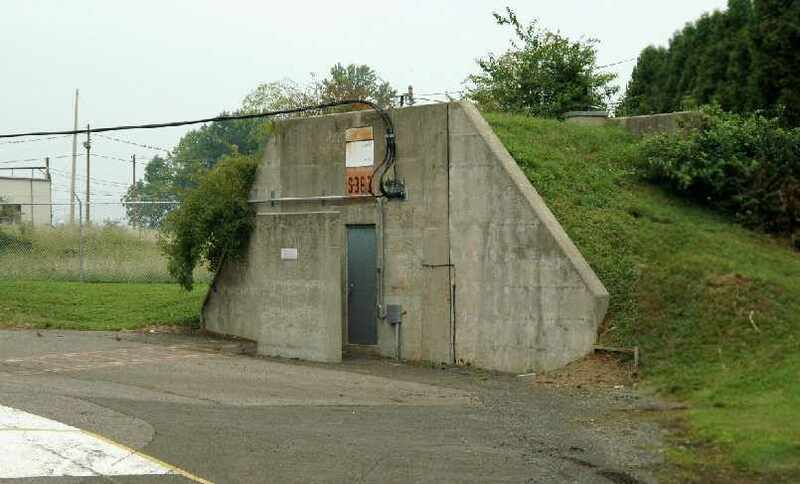 A 2004 photo of an unidentified former Warminster test facility which remains on Bristol Road. 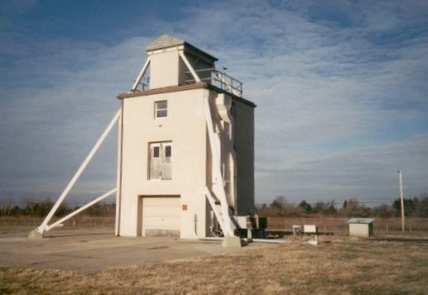 A 2004 photo of an unidentified tower which remains standing at Warminster. "What I can tell you is Warminster Township has too much open land to deal with & the place looks like a mess. and about 1/3 of the northeast end of the main runway still exists. bending left, and then going west into Jacksonville Road. despite attempts to convert them to indoor soccer facilities. I ran out of film at the centrifuge. That facility remains untouched & it appears the Navy may still have ownership of it. 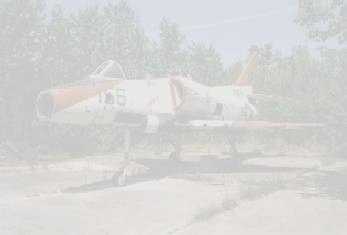 I think it's protected since it's a historical site, but that doesn't explain why the hangars were demolished." A 2004 photo by Christopher Ness of "all that's left of the runways & the current group flying out of it." previously used to store rocket charges (right next to the 200' ejection seat tower). 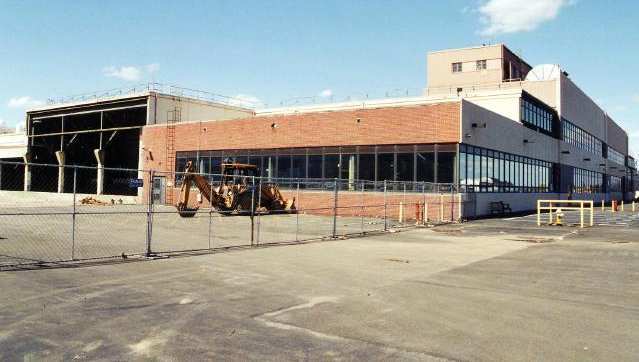 A 2004 photo by Christopher Ness of the building which previously housed the centrifuge. "A great deal of the NASA training took place in this building." An October 2004 photo by Aaron Kuhn of the west end of the former runway. "In the background on the horizon you see the Anne's Choice Senior living Community built on other decomissioned Johnsville base land. (to stop planes from landing one can only assume!)." showing "the remaining thousand feet of the runway. The intersection in the distance is Bristol Road & Hatboro Road." An October 2004 photo by Aaron Kuhn of the sign that resides on the Northwestern side of the base along Newtown road. The 3 remaining structures on Bristol road can be seen to the left of the sign. Department of the Interior for use by the general public." An October 2004 photo by Aaron Kuhn of what is presumed to be some sort of former test tower. 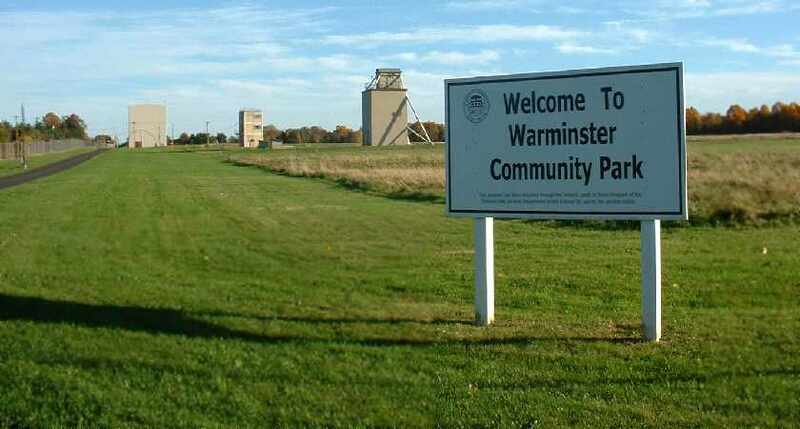 "The Warminster Community Park now resides on the land I took these photos from. then these structures & the runways will be removed to make way for sports fields on the site!" "On the $10 million parks referendum that may affect Johnsville NAS - it did not pass. So it looks like the old runway remnants will be there for a while still." 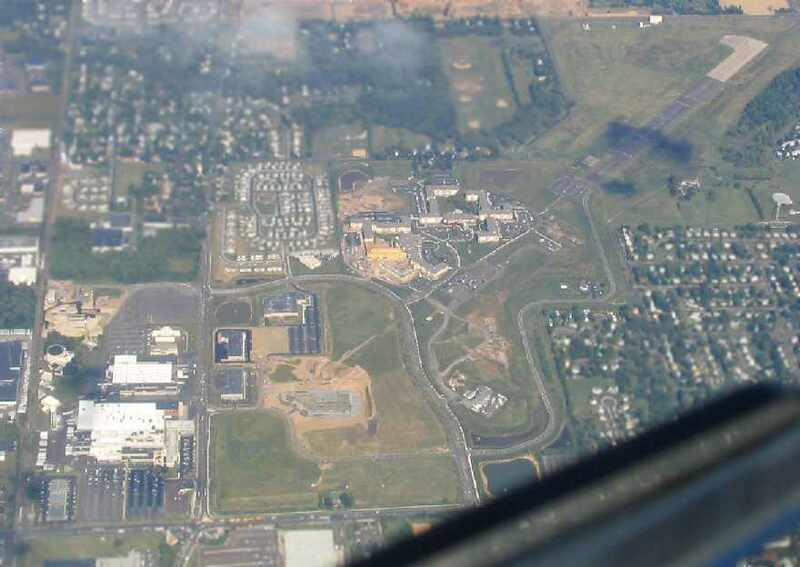 A 2005 aerial photo by Paul Freeman, taken from a Diamond Eclipse at 8,000 feet, looking northeast at the former NAS Warminster. and replaced by several smaller new buildings. 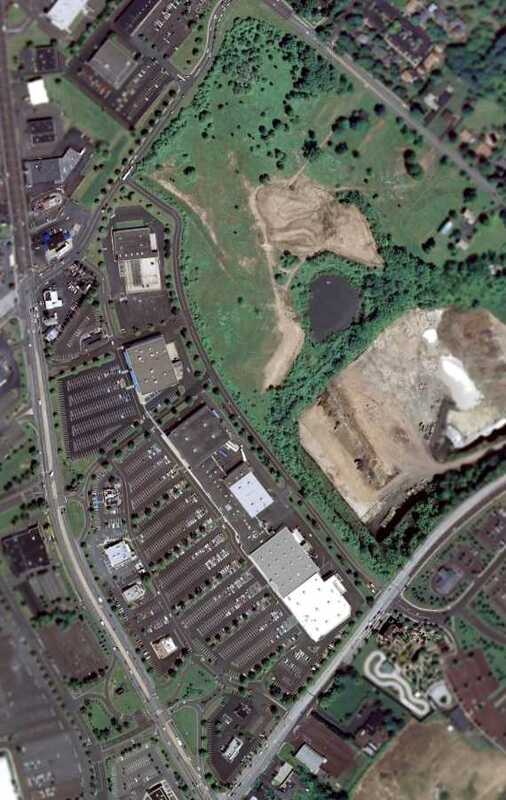 A circa 2002-2005 aerial photo looking north at the former Brewster Aircraft factory on the west side of the Warminster site. 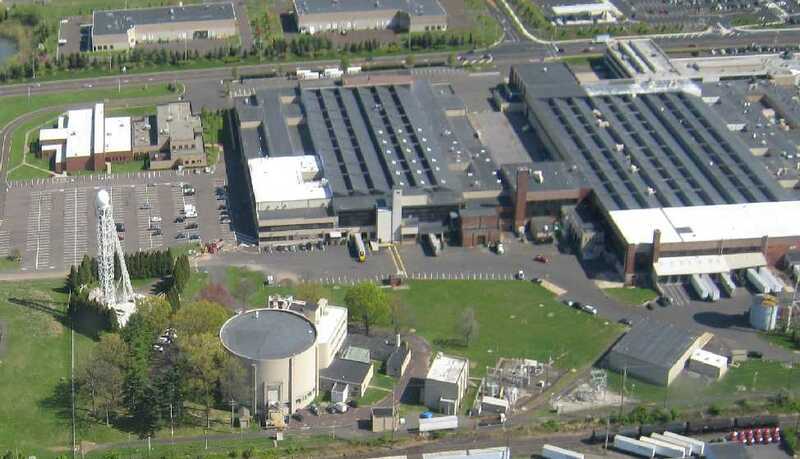 A circa 2006 aerial view looking north at the historic Warminster centrifuge building. According to Christopher Ness, “The radar ball is a recent add-on belonging to one of the local TV stations weather department. The tower is from the NASA (NACA) period. 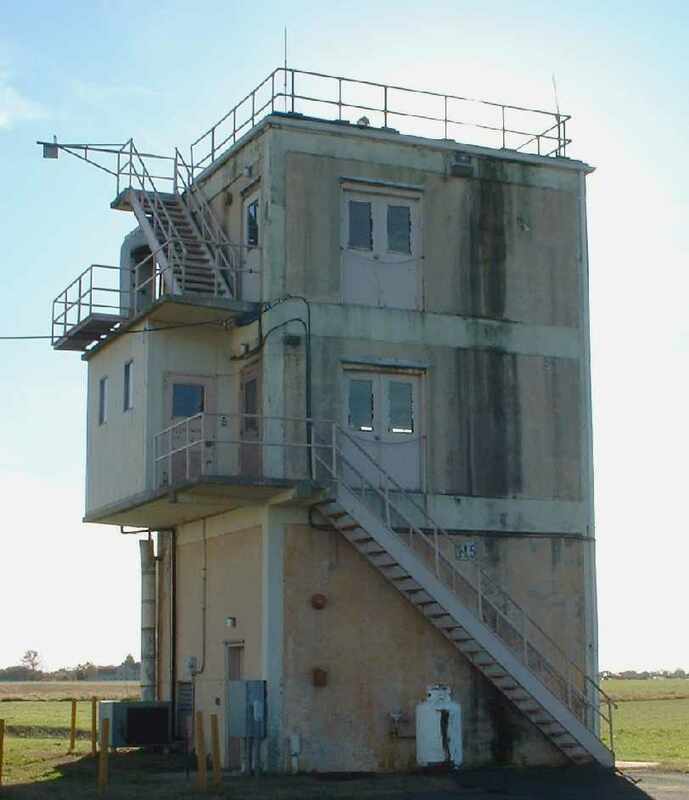 The smaller diagonal tower that connects to the heavier tower with the radome was a track for a rocket seat similar to an ejection seat trainer. A 1/7/07 aerial view by Philip Kineyko of www.FlyinPhilsPhotos.com, looking southwest along the remaining half of the Warminster runway. and the former Brewster factory buildings. A 2007 aerial view by Stefan Krause looking northwest along the remaining half of the Warminster runway. 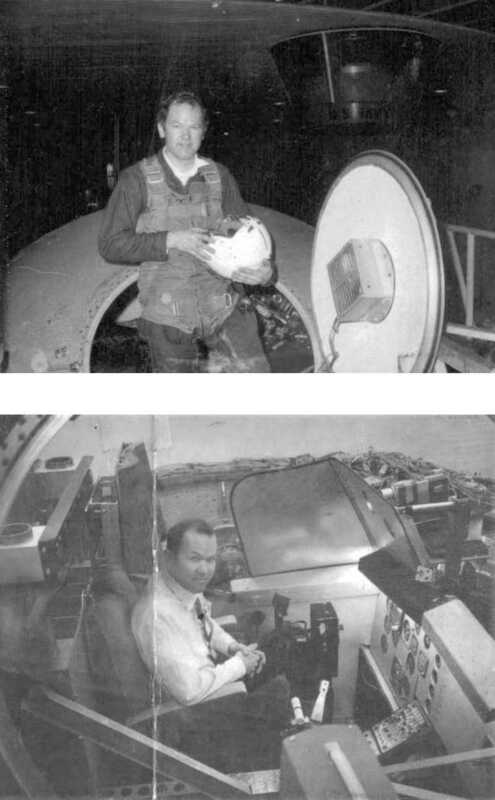 John Murawski reported in 2009, “The centrifuge building is indeed intact & in private hands. 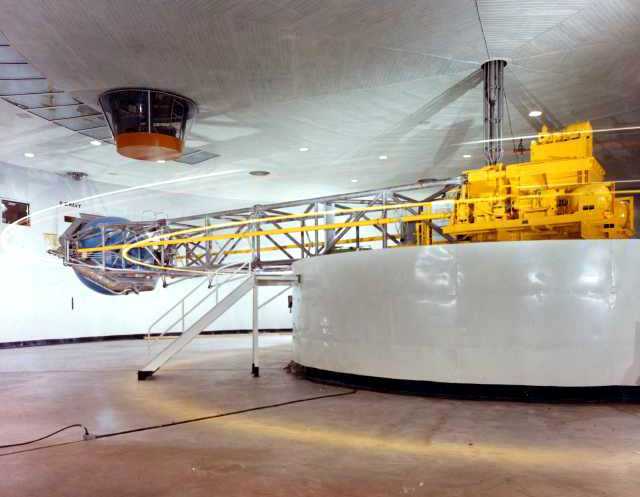 The 50' arm, motor & gondola are still in place although the centrifuge is no longer operational. 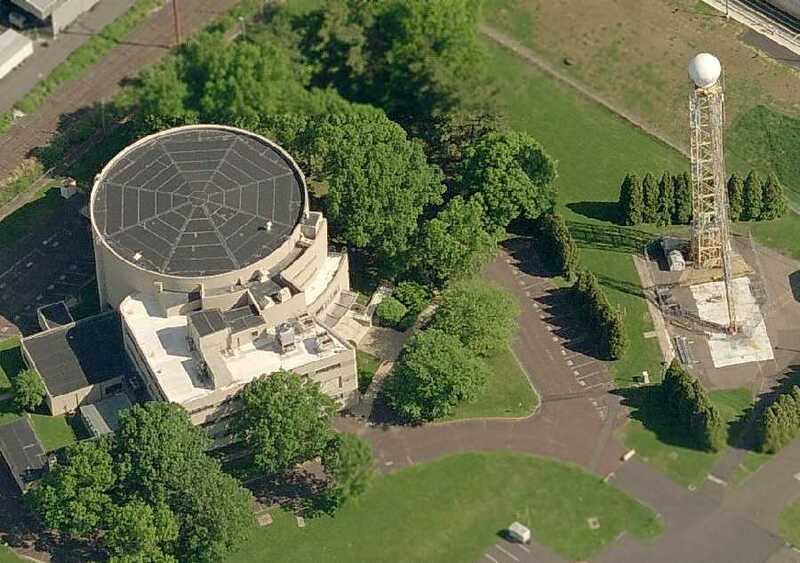 Plans are underway to convert the facility into a space & science museum [The Johnsville Centrifuge & Science Museum]. Additionally, efforts are underway to recover the original gondola that was used for early testing. It is being held in a storage yard by the Smithsonian. The test towers are also visible in the foreground. A 4/13/12 aerial view by Mike Schatz looking southeast at the historic former Brewster factory, and the historic centrifuge in the foreground. M. Allen reported in 2012 that the historic Warminster centrifuge & its building are being reused as a party-hosting facility, The Fuge. He reported, “The centrifuge is still there! The pivot itself is used as the DJ booth, spotlight, and general controls. The capsule isn't used. 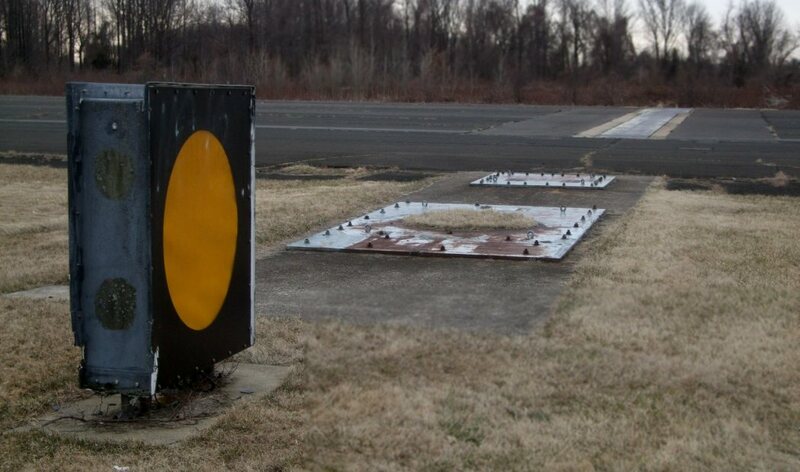 A March 2014 photo by Ron Plante of “what looked like remnants of the emergency arresting gear (BAK-something) at the eastern end of Runway 9/27. I was unprepared for the MASSIVE development. I could not find the control tower, but I did manage to find what’s left of the runway at the Warminster Community Park. There are concrete blocks along with yellow X markings. A 3/5/172 aerial view by Dennis Boykin looking southwest at the remaining western half of the Warminster runway.